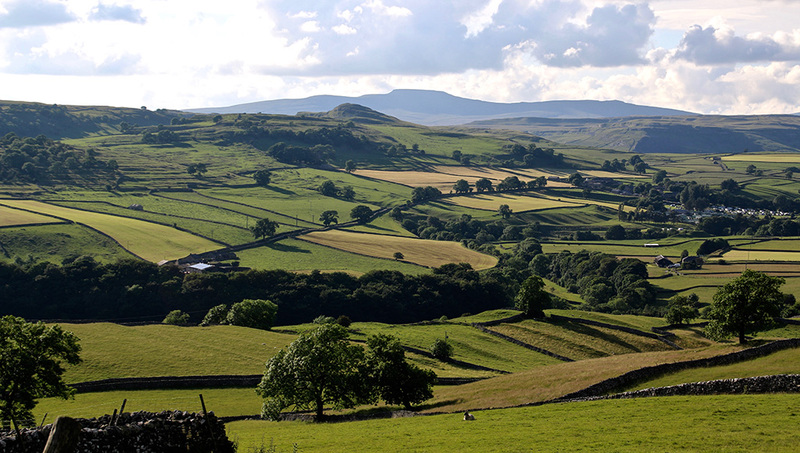 A Dales dawdle drive is something I enjoy greatly during retirement. My son, who runs a business in which he needs to travel the Dales roads daily, curses folk like me. His cab van fills with words I certainly didn’t teach him when he gets stuck behind the doddering old Dales dawdle driver. 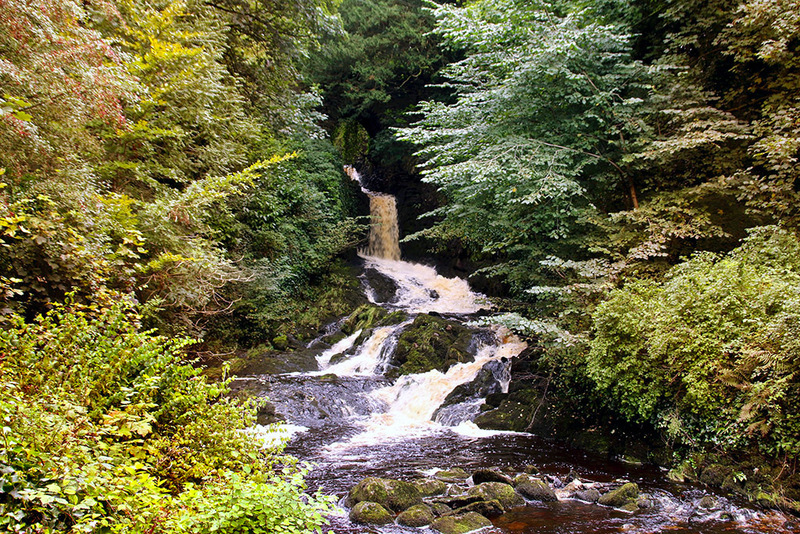 Set off earlier and enjoy the view I tell the impetuous youth. 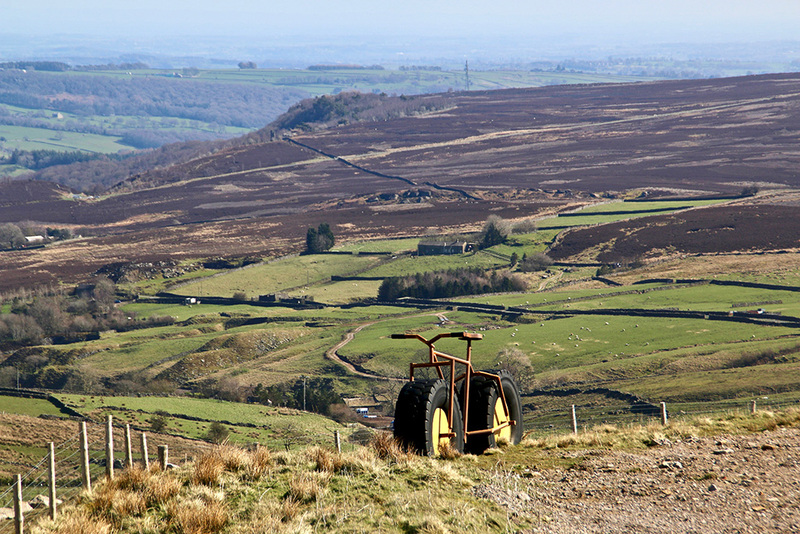 If I’m not feeling too cantankerous I will pull over on seeing a ‘worker’ wanting to pass, as I did for white van man along the narrow road between Halton Gill and Arncliffe on a bright February day this week. 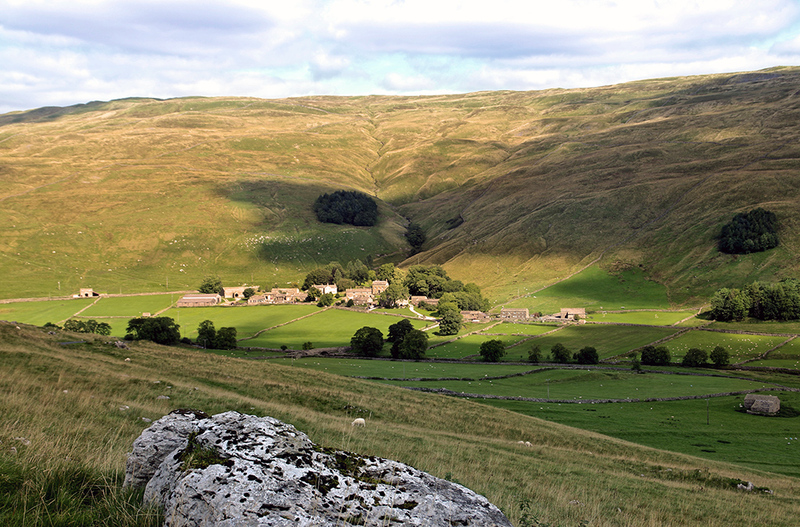 Sadly, the Queens at Litton wasn’t open on that morning saunter along lovely Littondale. 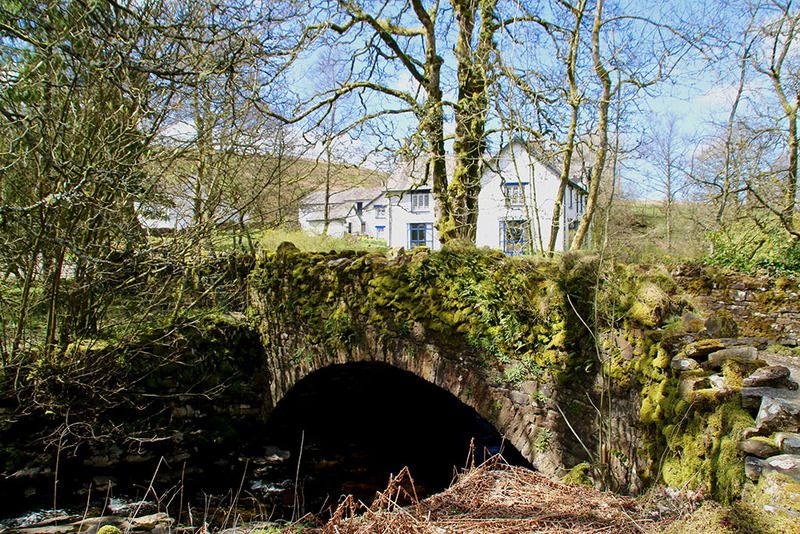 Earlier I (yet again) called in at Stainforth to admire the ancient packhorse bridge (top photo in blog). I’ve been visiting this spot for more than fifty years now and never tire of it. 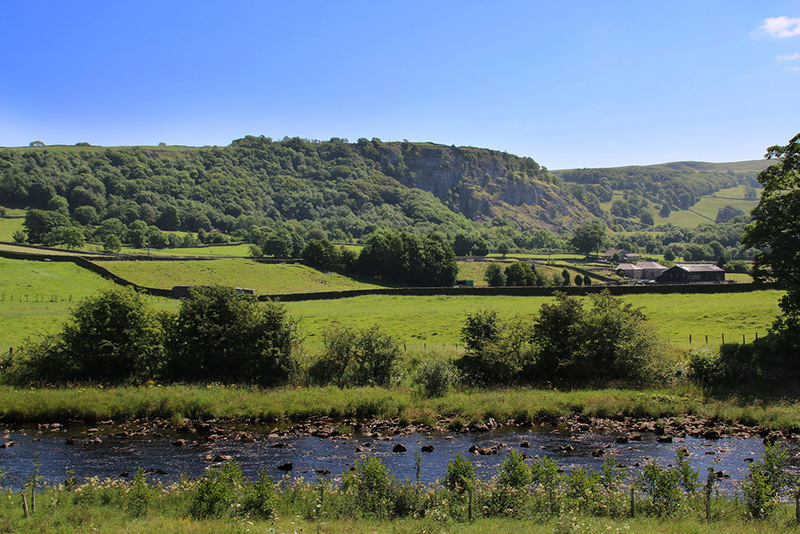 I always stop or slow to admire the cosy location of Halton as I pass over the brow on the road from Stainforth. 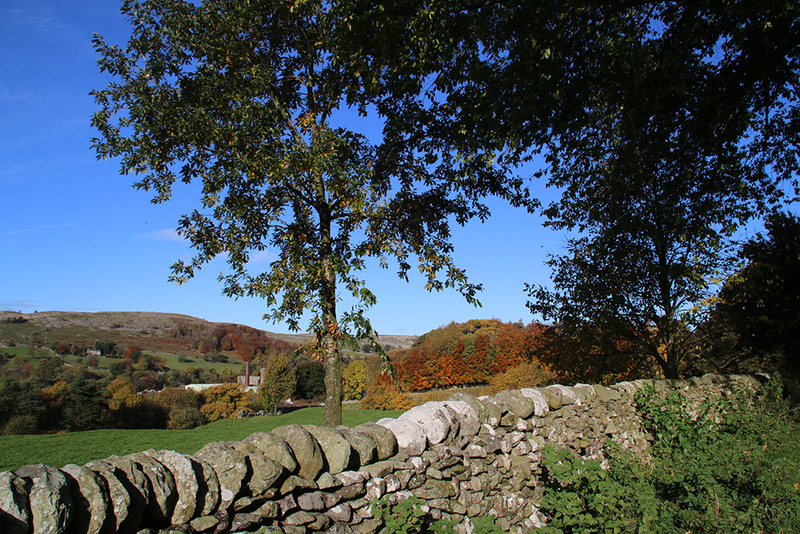 View to Arncliffe from the Darnbrook road. 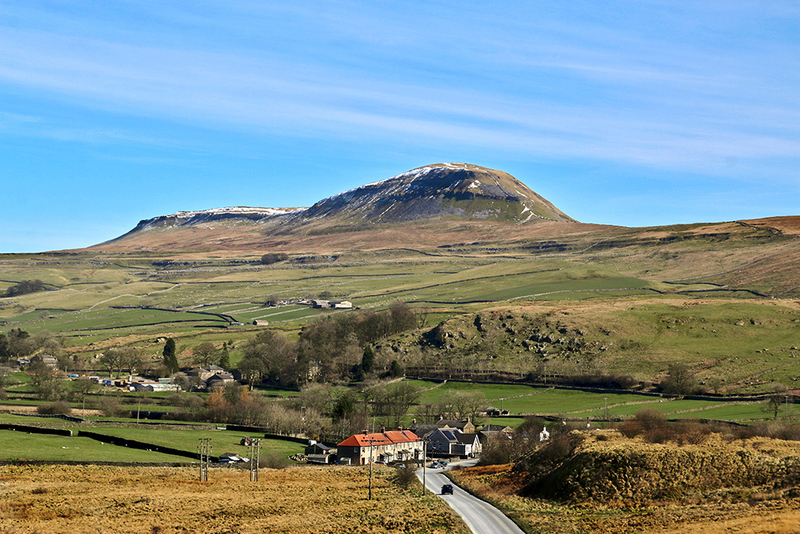 Looking back through photos from previous years I notice a few fabulous Febs, but last year I see snow in Ribblesdale during the month, while in 2016 the first week of March is a fair covering of the white stuff. I wonder if this year will be the same? There is an abundance of snowdrops this year as well as crocuses and even daffs. Pink blossom is sprouting on a neighbour’s tree and the birds are getting excited. If you’re reading this in southern England you’re probably muttering ‘so what?’. 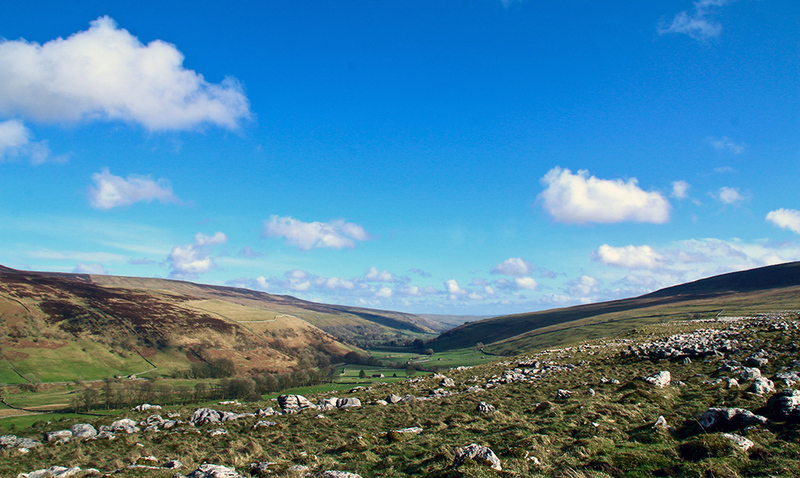 I can tell you that here in the Yorkshire Dales it is unusual for February. 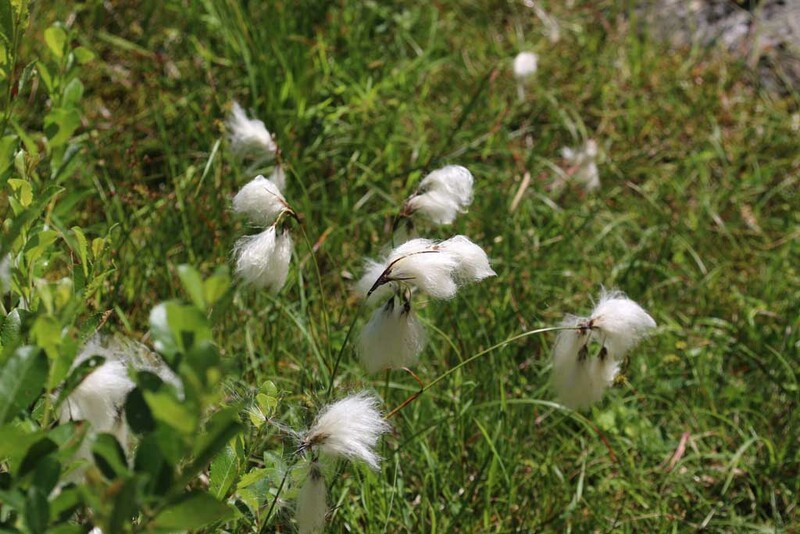 My photos show bright blue skies, mellow sunsets, and grass much greener than normal for this time of year. 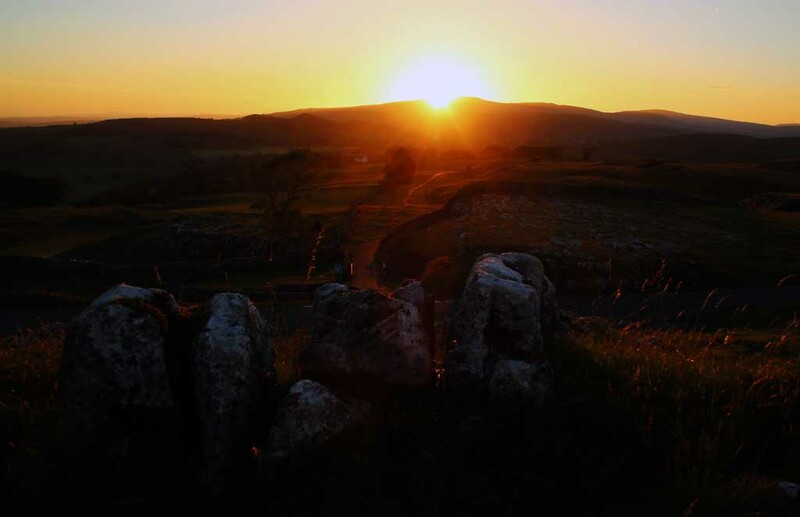 Looking west from above Ingleton at sunset. 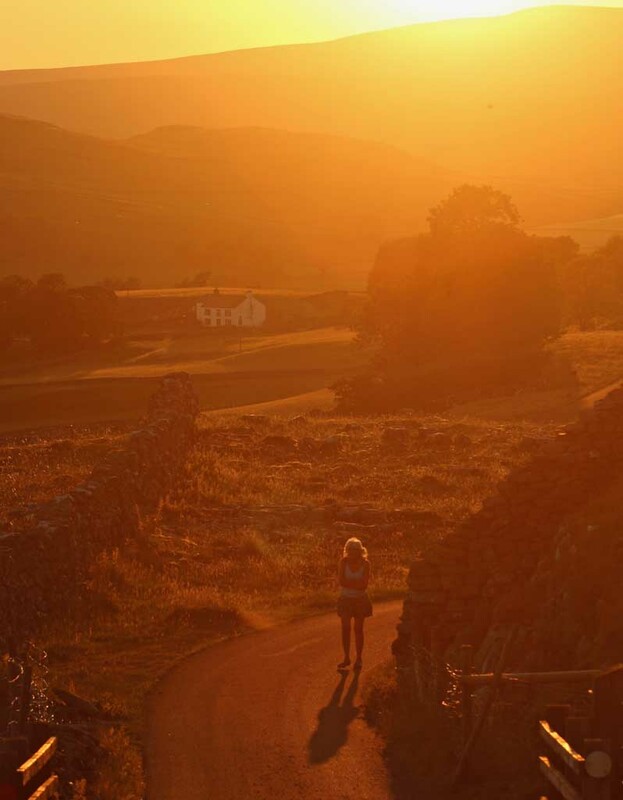 The setting Sun shines on Newhouses below Penyghent. 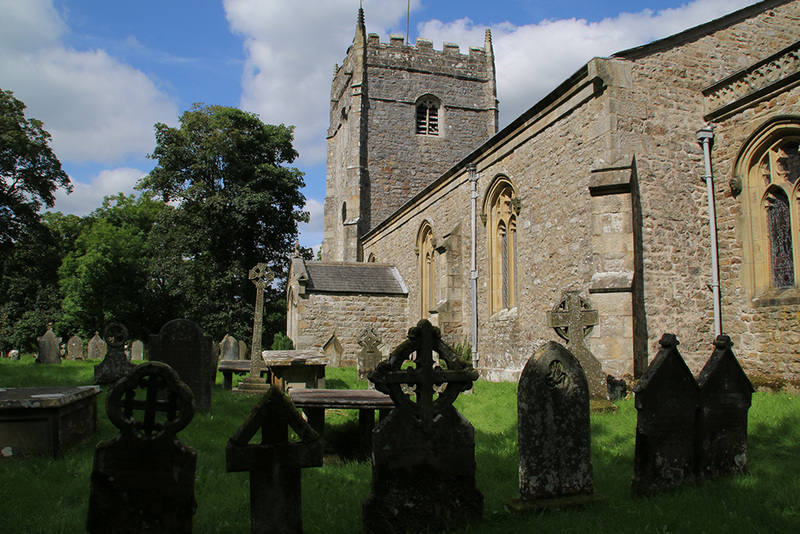 I like the church of St Oswald at Arncliffe with its fifteenth-century tower. 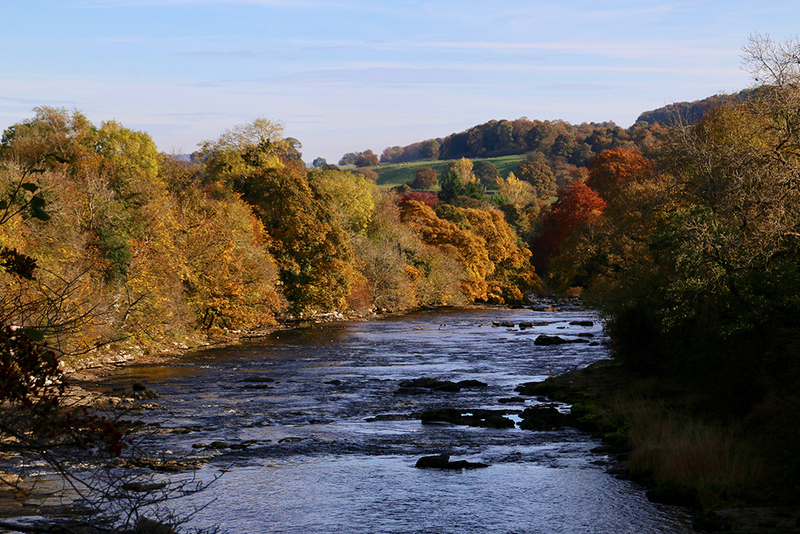 There’s been a church on the bend of the River Skirfare since Saxon times. 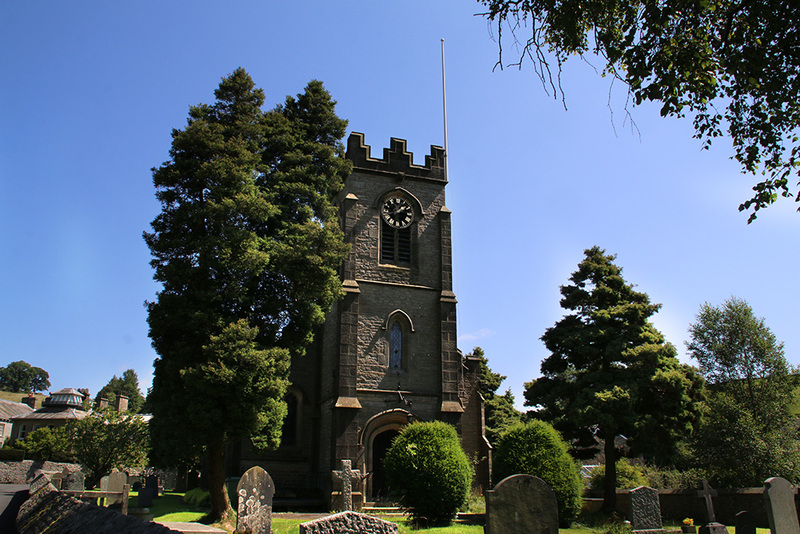 One of its bells dates from around 1350. 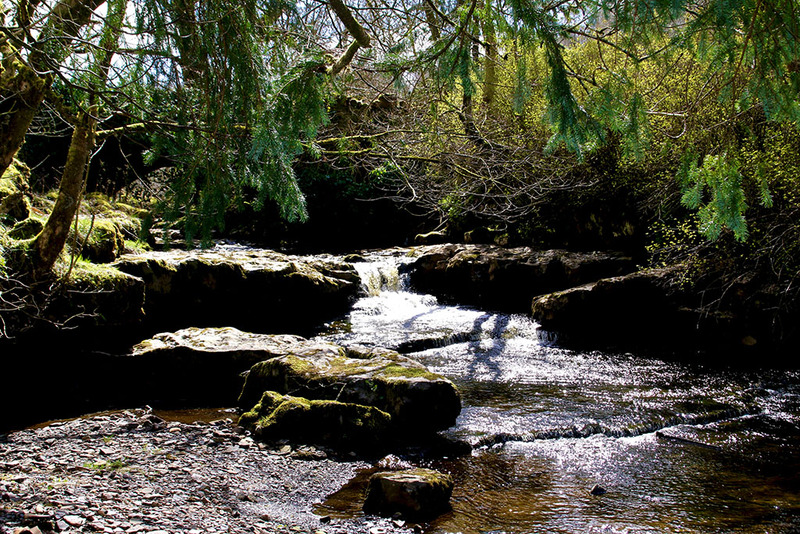 Sitting in the churchyard among the snowdrops and ancient trees, watching the river rattle by, it is easy to see how nineteenth-century author Charles Kingsley was inspired to write ‘The Water Babies’ while on a visit here. 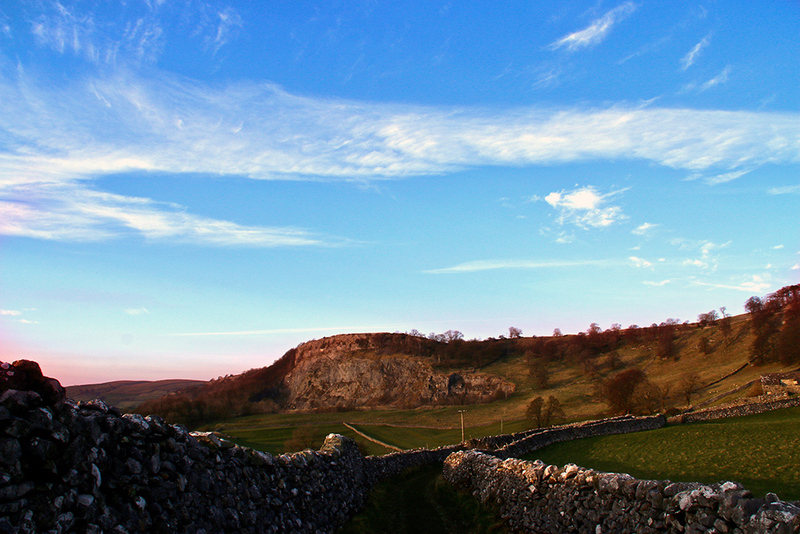 The Falcon wasn’t open either so I head over the steep switchback via Darnbrook and by Malham Tarn back to Langcliffe. 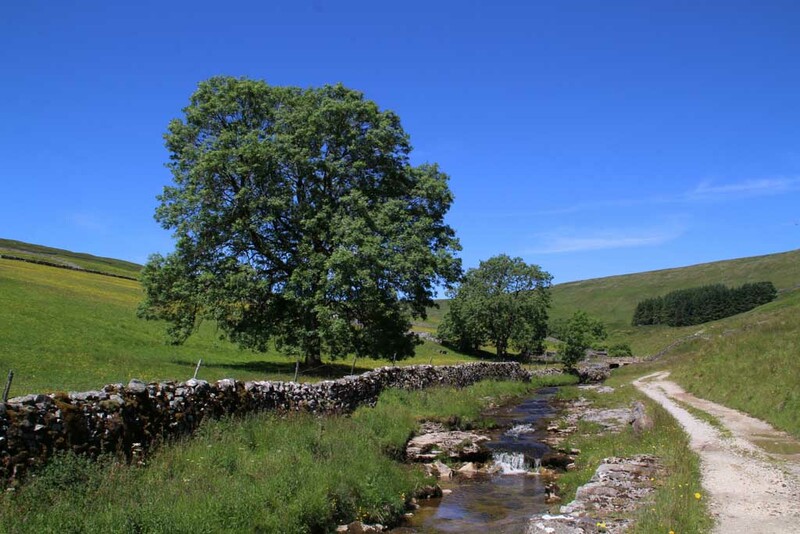 A delightful Dales dawdle drive. 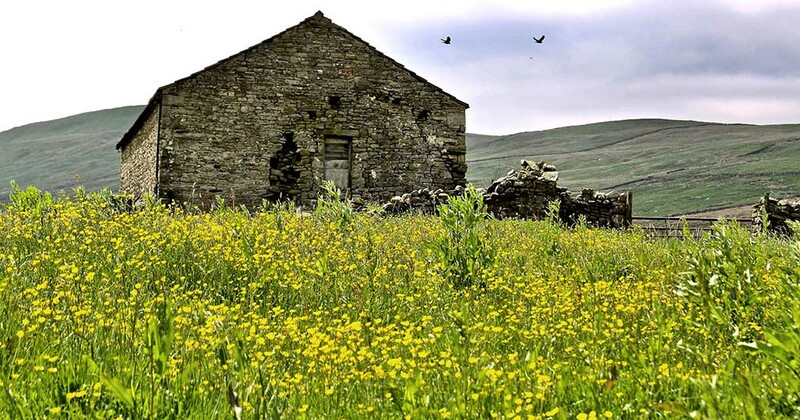 This barn’s been looking over Crummackdale for centuries but its best days are gone. 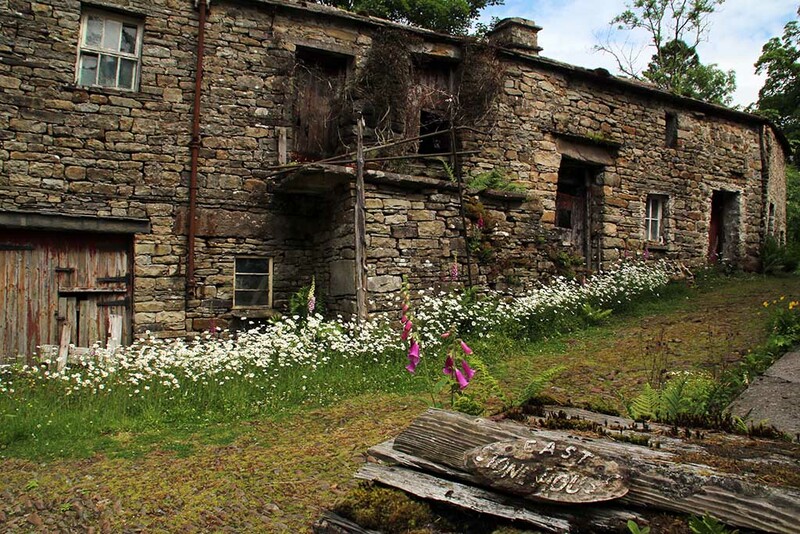 I don’t like to see Dales furniture and history crumbling away. 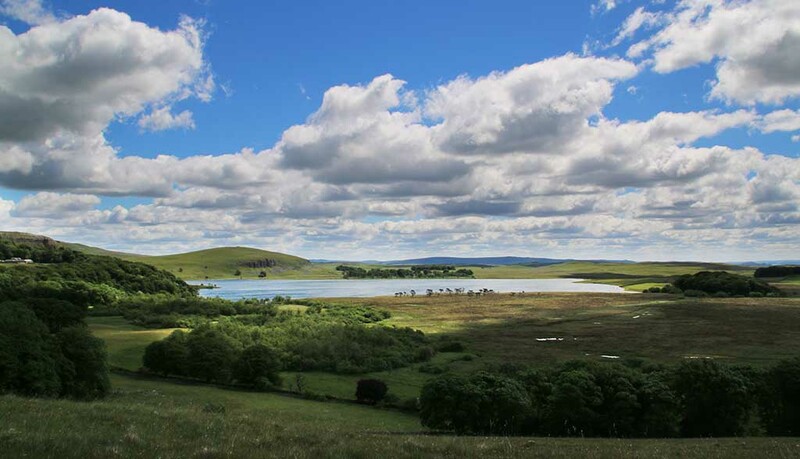 On a quiet stroll round Malham Tarn in the winter sunshine. 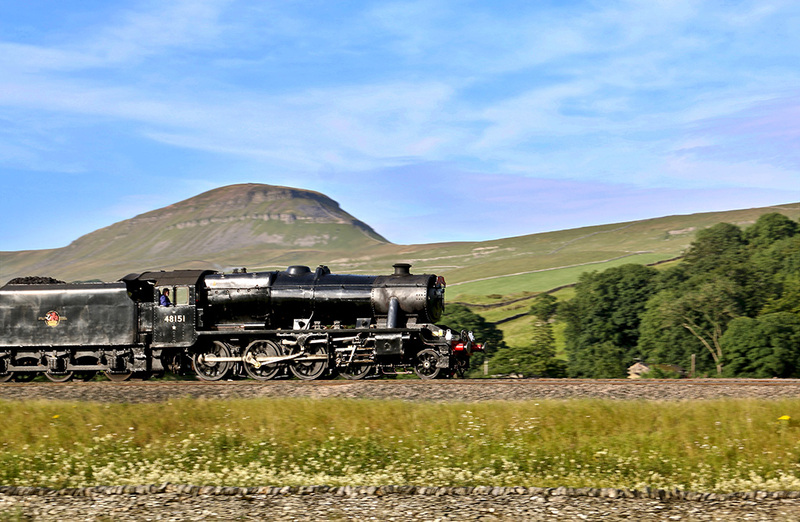 Steam excursion along the Settle-Carlisle railway in Ribblesdale. 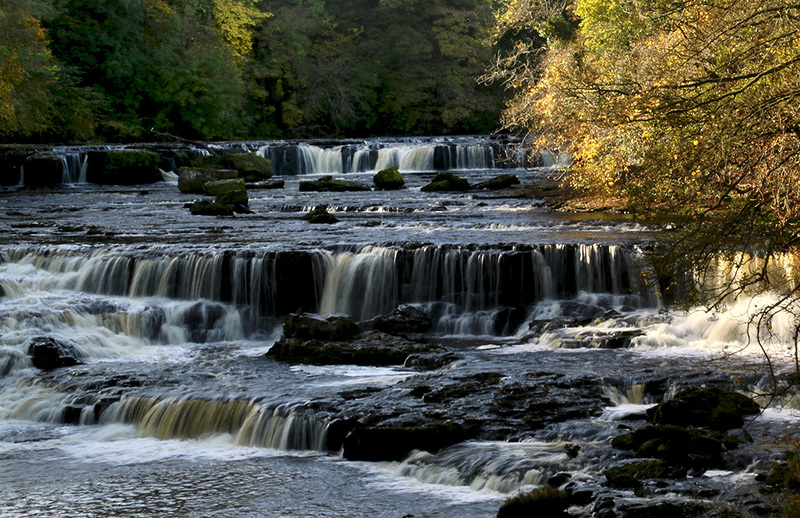 17 Yorkshire Dales images this week. So, I made it to 65 – I can’t say unscathed, but here I am, now an Official Ancient Person, Silver Surfer or Grumpy Old Git – whatever you want to call us. There was no big fanfare on my birthday no “whooping an’ a ‘ollering” as I escaped the shackles of work. 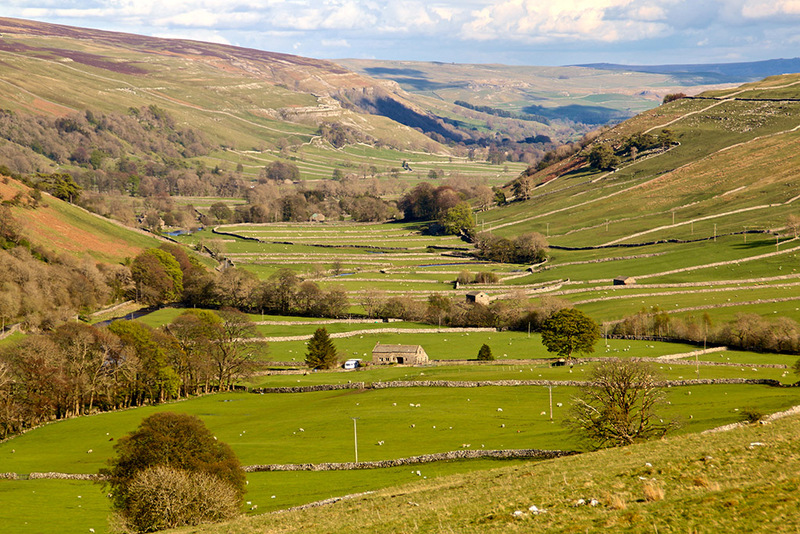 I retired from full time employment five years ago to gently ease myself into a more sedate way of life in the Dales. I read about this thing called ‘well-being’; that this was the secret of a long and satisfying retirement. 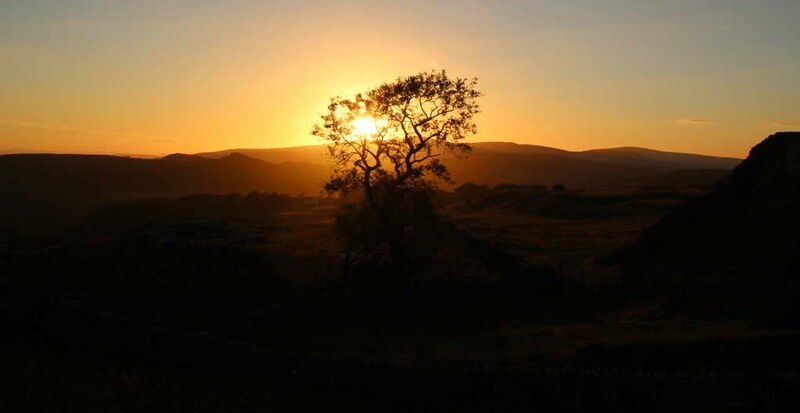 The countryside, Nature, fresh air and peaceful surroundings help make up this ‘well-being’ thing, so I’m in just the right place here in the Dales. Perhaps I’ll still be posting a photographic blog (or whatever will replace the internet, computers and cameras) in 2053 when I hit 100. 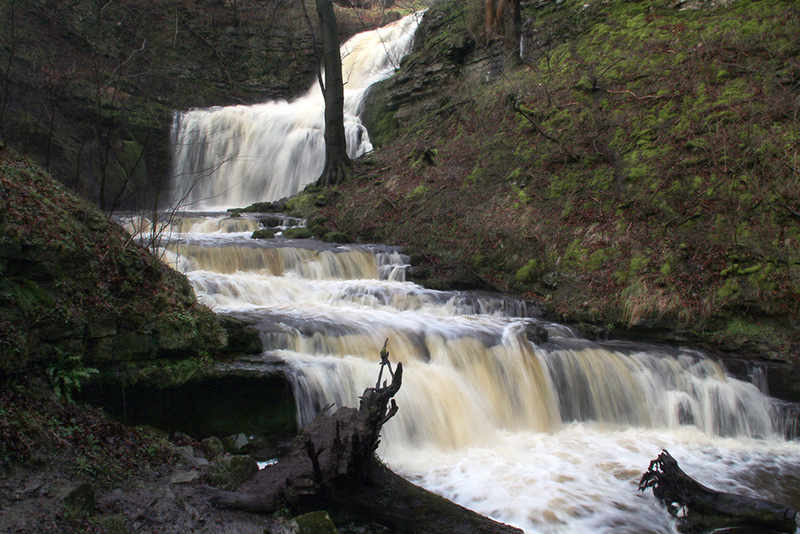 To celebrate and enforce my ‘well-being’, I’ve put together a collection of photos showing just a few of my favourite Dales places. 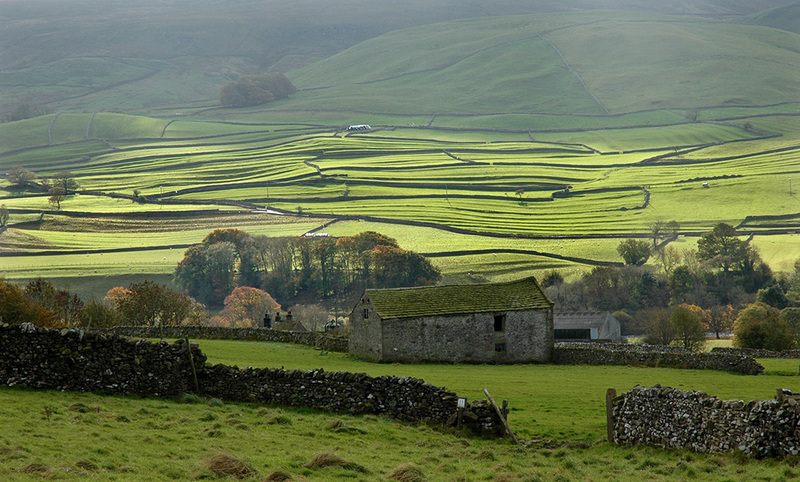 Top photo shows fields near Appletreewick. 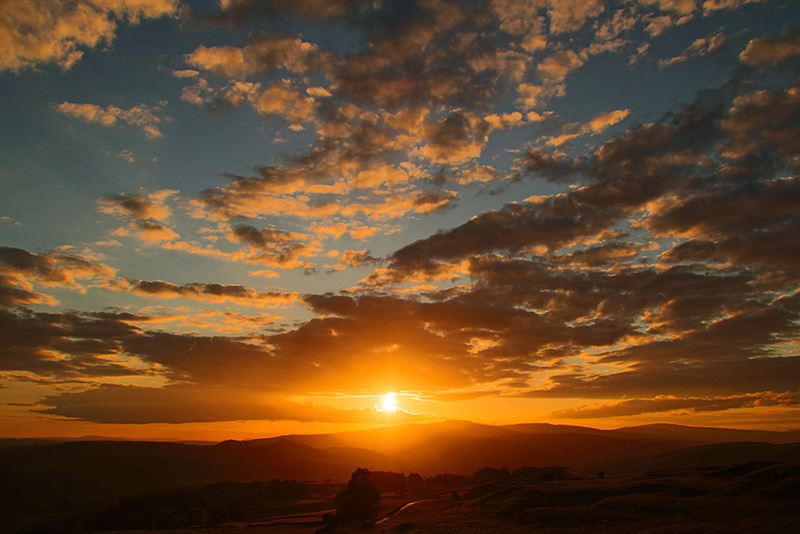 Above, sunset over Ribblesdale. 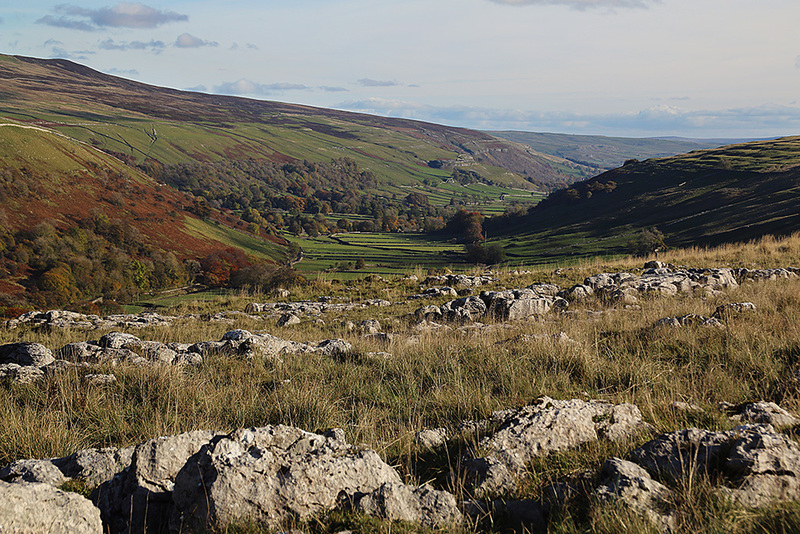 View down Wharfedale from Conistone Pie; below, Man turns the rocks into houses – Halton Gill. 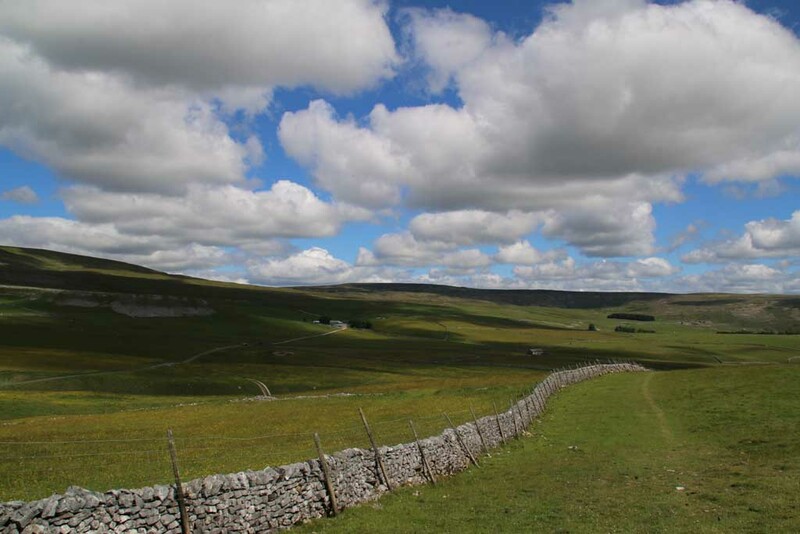 Malham Cove when the tourists have gone home; below, Dentdale. 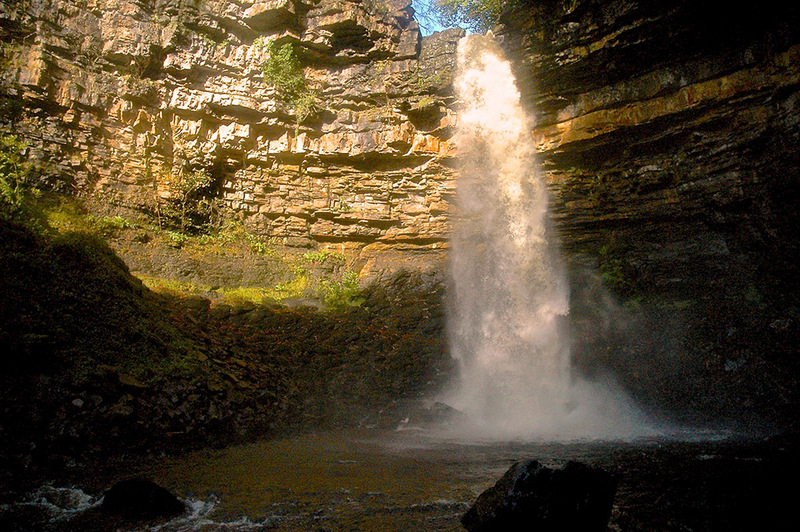 Hardraw Force in Wensleydale; below, Moughton Scar, as approached from Ribblesdale. 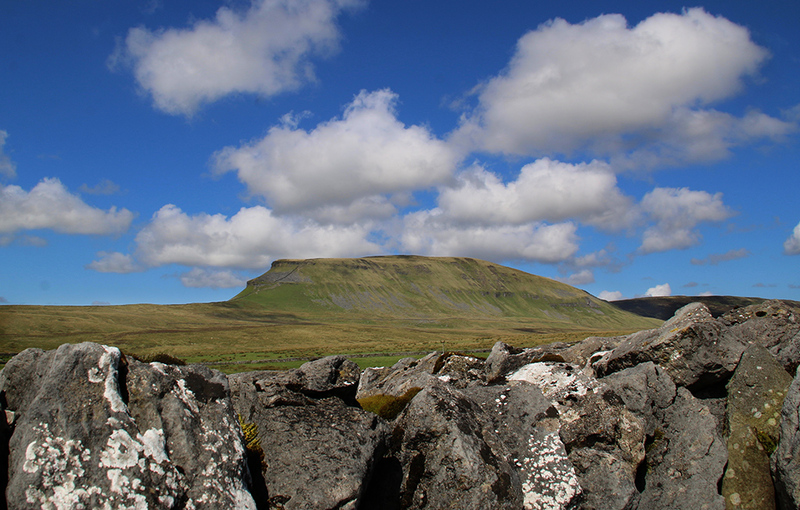 Ingleborough seen from Kingsdale; below, Nidderdale seen from Greenhow. 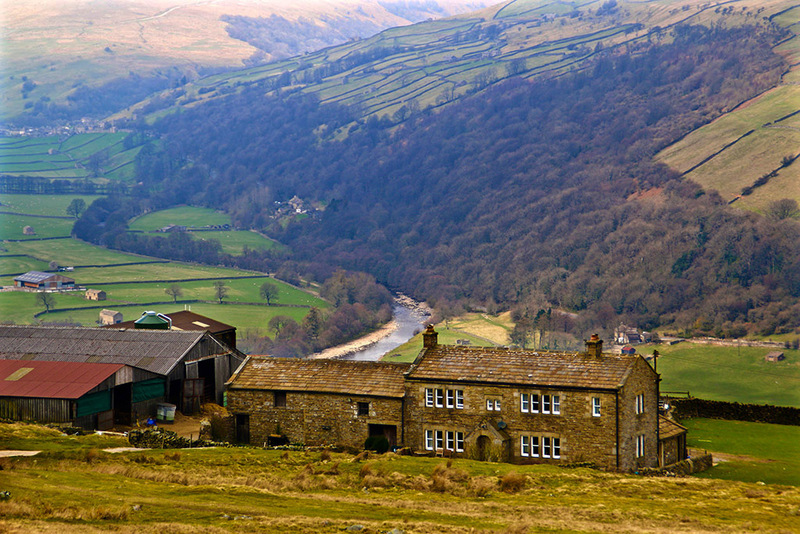 Light and shade above Arncliffe; below, spring at Gunnerside in Swaledale. 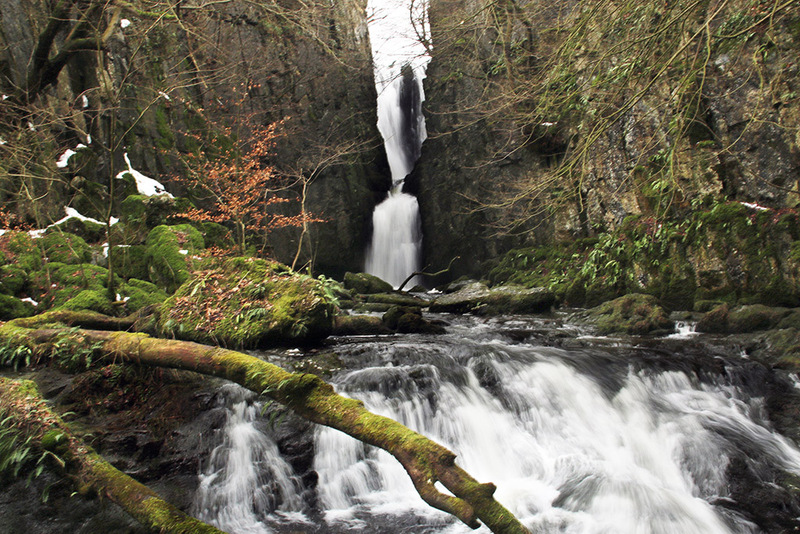 Catrigg Force; below, stopping for breath on the track from Stainforth to Cartrigg to look back on Smearsett Scar. 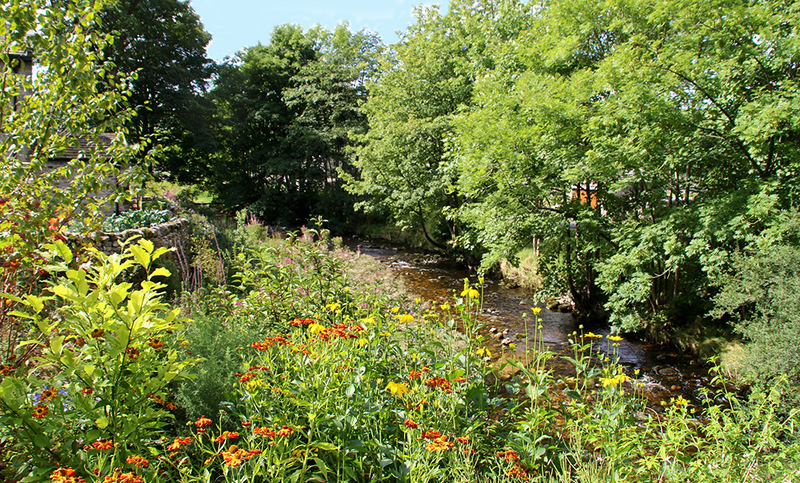 Yes, I’m lucky to live in the Dales, but people in urban towns also deserve green spaces for their own well-being. 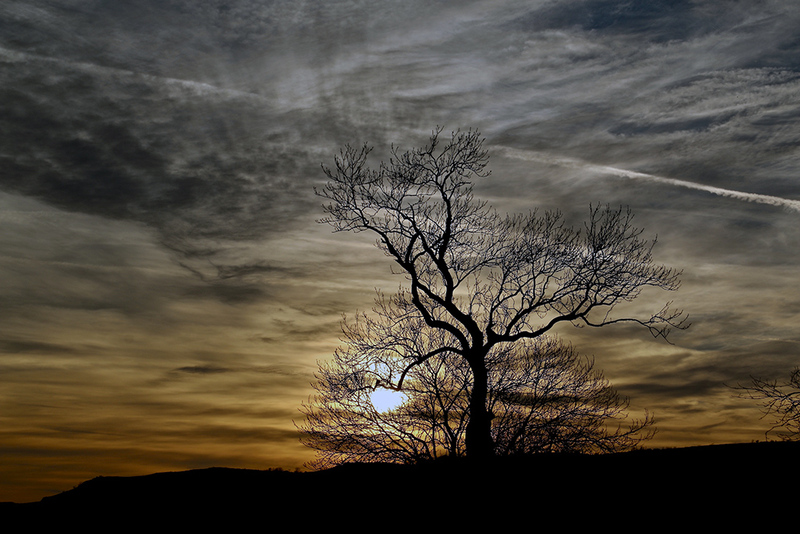 Parks are for playing, relaxing and escaping – but right now they’re in crisis. Cash strapped councils have been forced to slash the funding used to keep these public spaces alive. 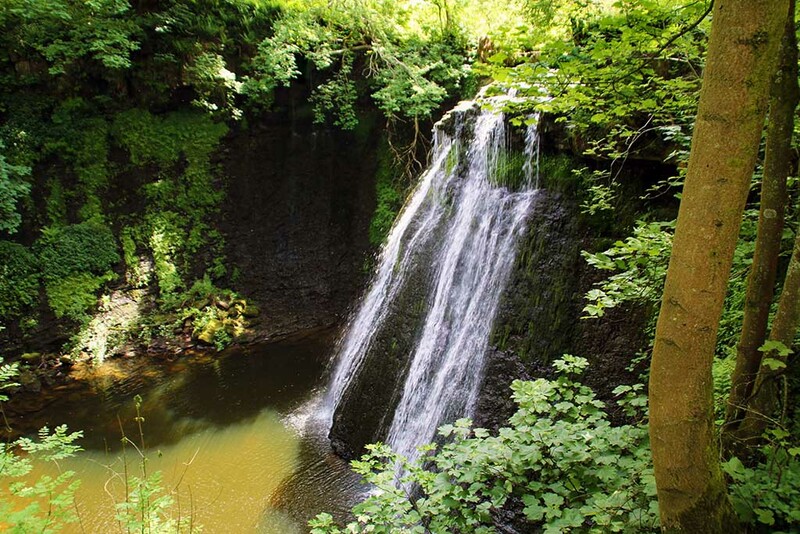 And now, one of the last pots of money our parks could rely on has also been axed. 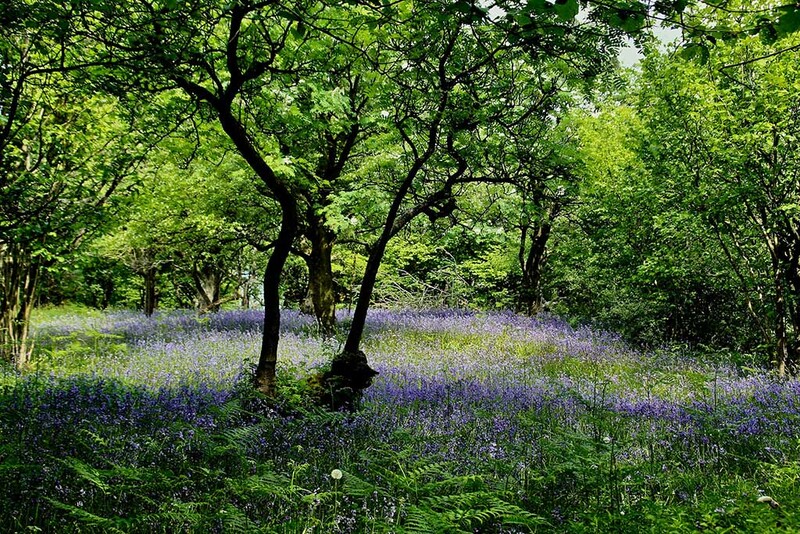 The Heritage Lottery funded parks programme has been scrapped, putting the future of our parks further at risk. 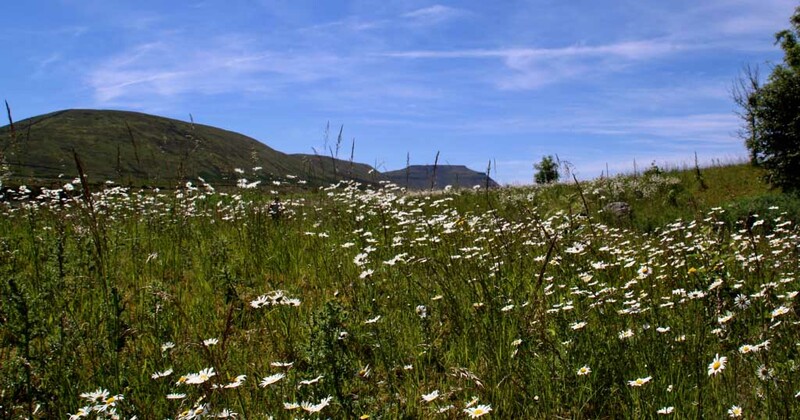 In response, the Parks Alliance have started a campaign to make sure parks get this vital funding back. 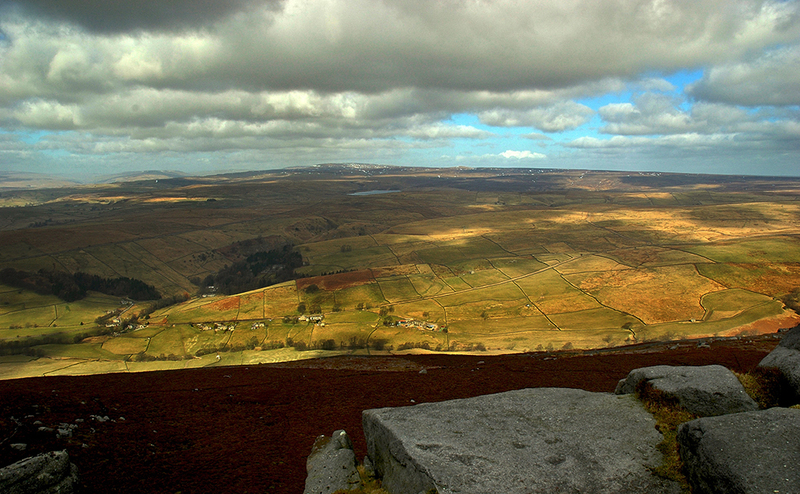 View from Simon’s Seat, Wharfedale; below, looking over Rowleth up Swaledale; last photo shows lovely Littondale. 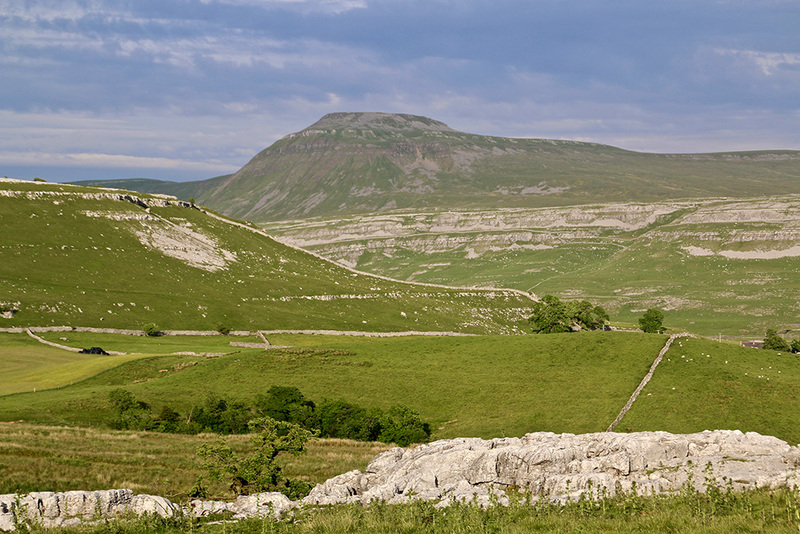 The dales took a back seat this week as I’ve been working on a project with my son. 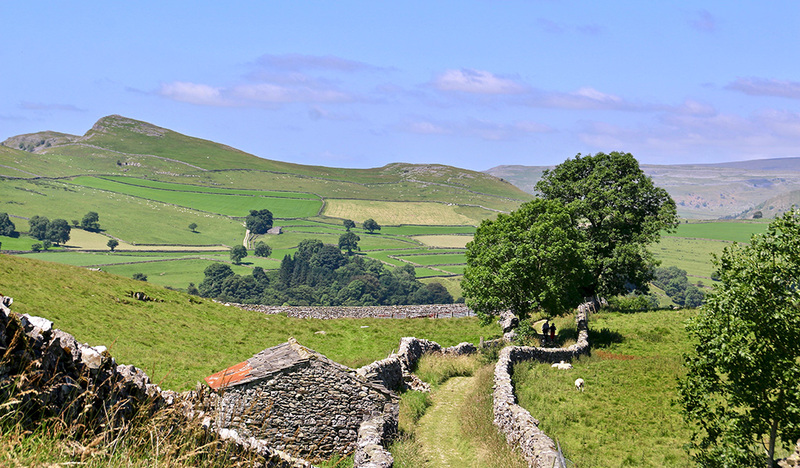 So it felt grand to take a short break one afternoon for a trip in the sun between Ribblesdale and Littondale. 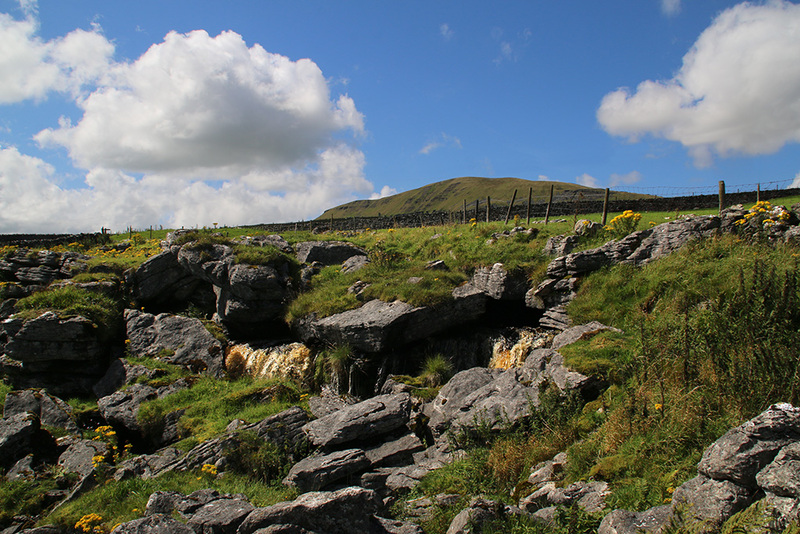 Penyghent, Plover Hill and Fountains Fell all looked glorious from the narrow Silverdale Road before clouds eventually descended and turned the scene grey. 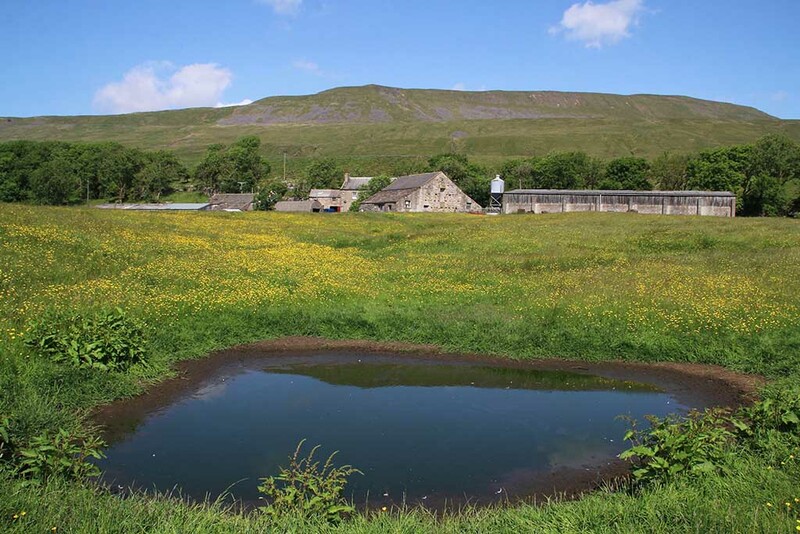 The fascinating area around Giant’s Grave, where water for Penyghent Gill springs from any number of mysterious underground caverns through holes in the dishevelled looking rocks, was bursting with colour. 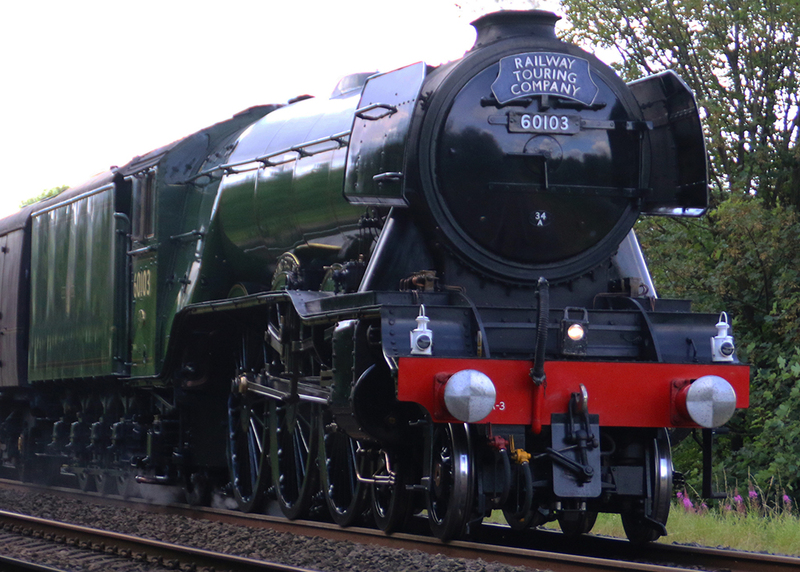 I timed my walk last Sunday with the arrival of Flying Scotsman near Langcliffe on the Settle-Carlisle line. It really looks a big beast close up. 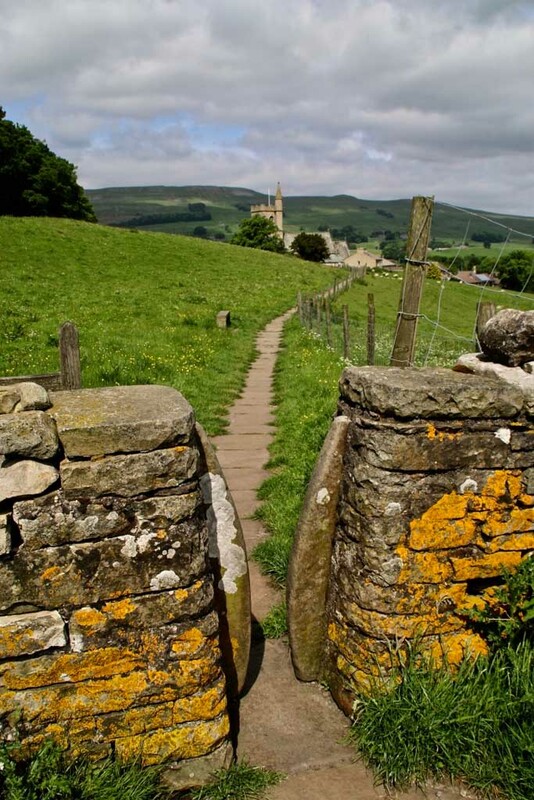 I spent my childhood in Yorkshire’s Heavy Woollen District and despite residing for much longer here in the Dales there are certain words and phrases I still use from those early years that give away my past. Not that I’ve ever tried to hide my upbringing in the working class mill-town area of the county of which I am very proud, but whoever you are and wherever you are from you will usually retain some of the local lingo. 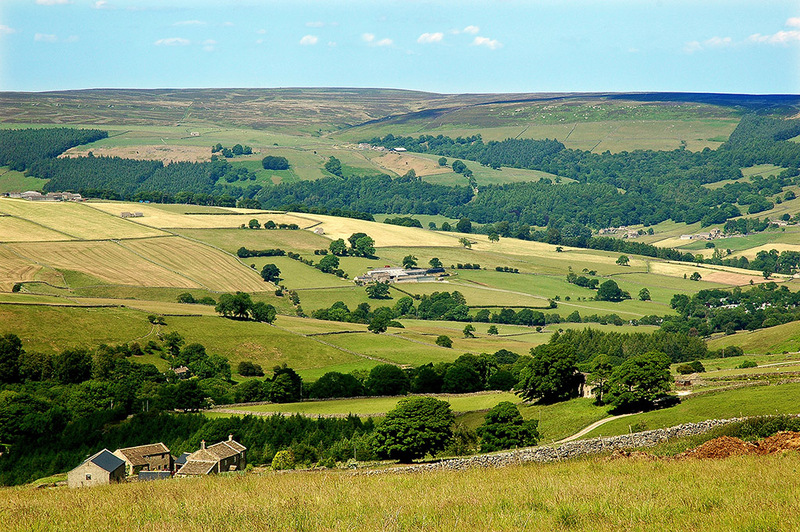 I brought up the subject of different dialects and sayings within Yorkshire when I edited Dalesman, and boy did it open a can of worms. Correspondence about certain words is probably still continuing many years on. I was reminded of all this during the week when I went into a local bakery and without thinking asked for teacakes. It’s not the first time I’ve done this and regretted it. I was brought up to believe a teacake was a plain, white, flat-ish, light, round of bread about the size of an adult hand. None of your bread cakes, balm cakes, stotties or whatever other fancy name you want to give them. And where I came from if you wanted one with fruit in it you asked for a currant teacake. 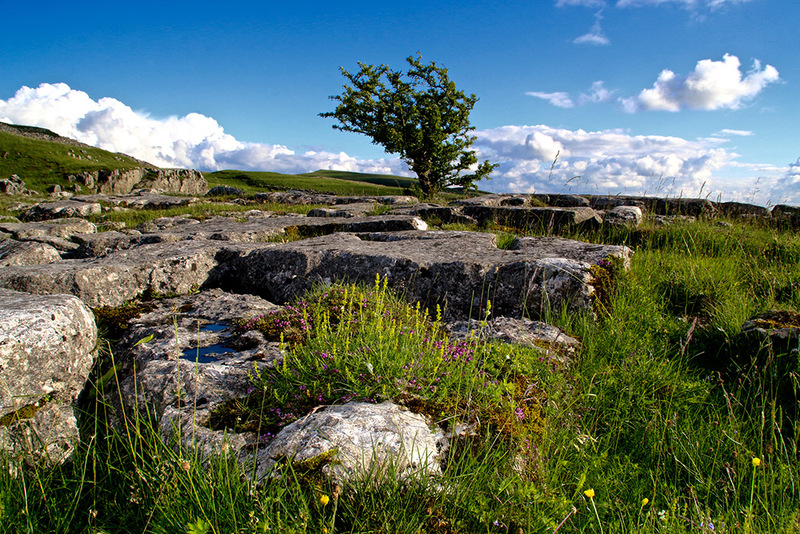 Simple job then, but not now, not here in the Dales anyway. In the shop I’m questioned, slowly, like I’m some kind of half-witted alien until I end up just pointing to what I want, paying up and leaving the shop red-faced. My surnames page is proving really popular with visitors from all over the world. Is your surname there yet? 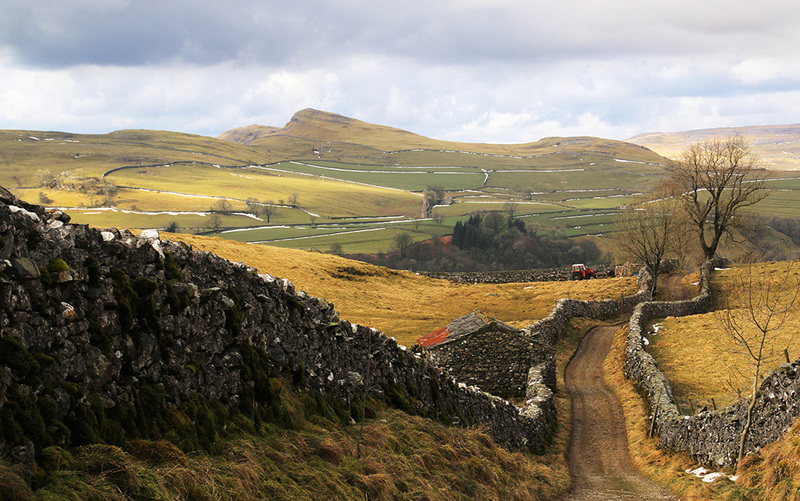 The blog (+12 pics) title refers to a Dales walk I did on Monday. 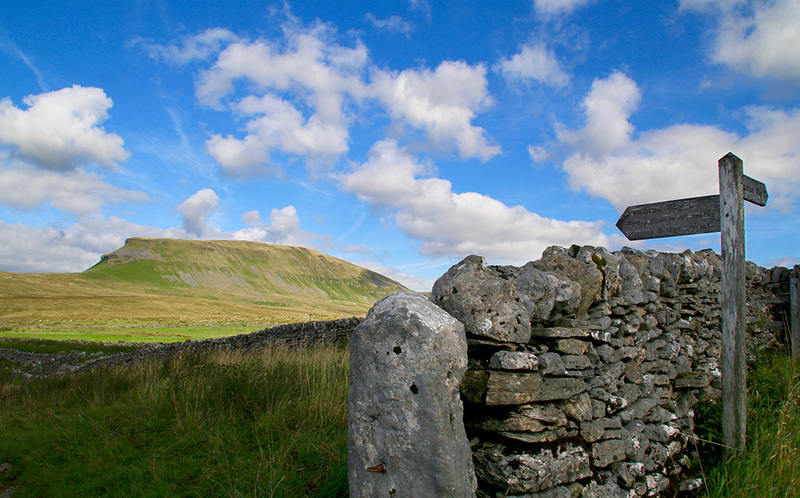 Many locals will know the 5-mile circuit from Langcliffe in Ribblesdale. 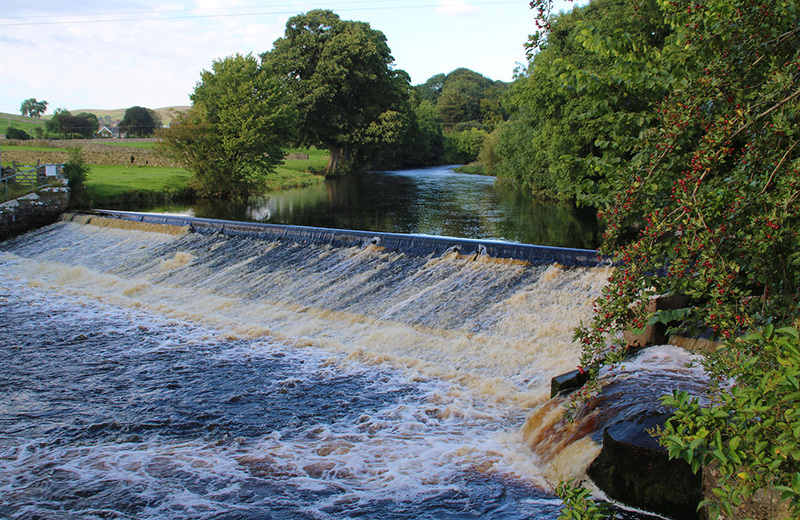 Starting from the village head down to the mill and around the mill pond to cross the Ribble at Langcliffe Locks. 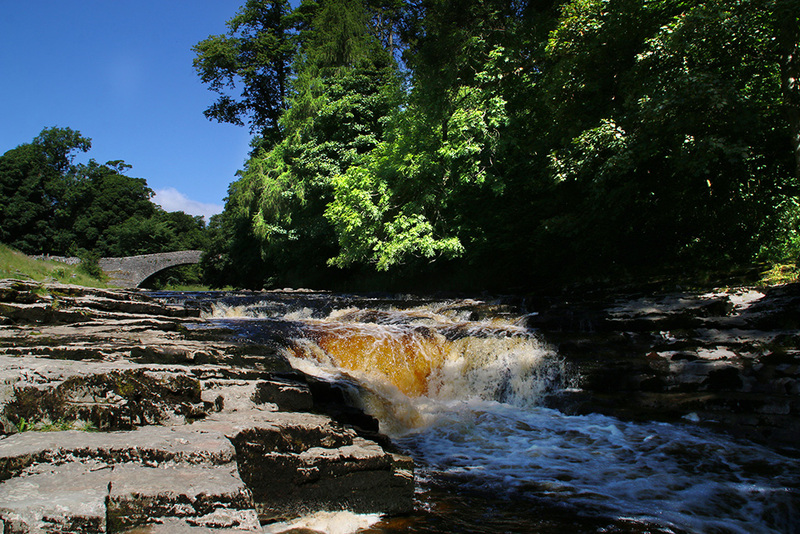 Follow the river up to Stainforth Foss, over the packhorse bridge and up into Stainforth. 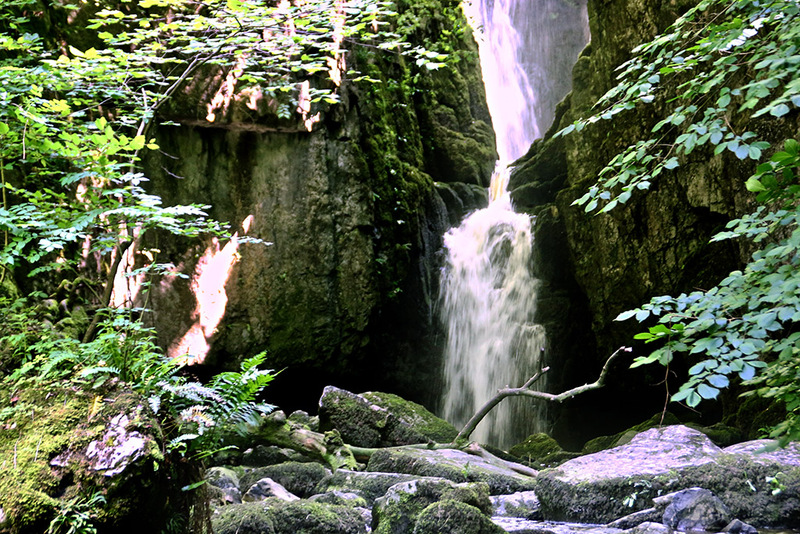 Take the road by the church up to the stepping stones over the beck, then up the steep track to Catrigg Force (the submission part is where you wrestle with the path and have to stop several times for a large breather and take a photo). 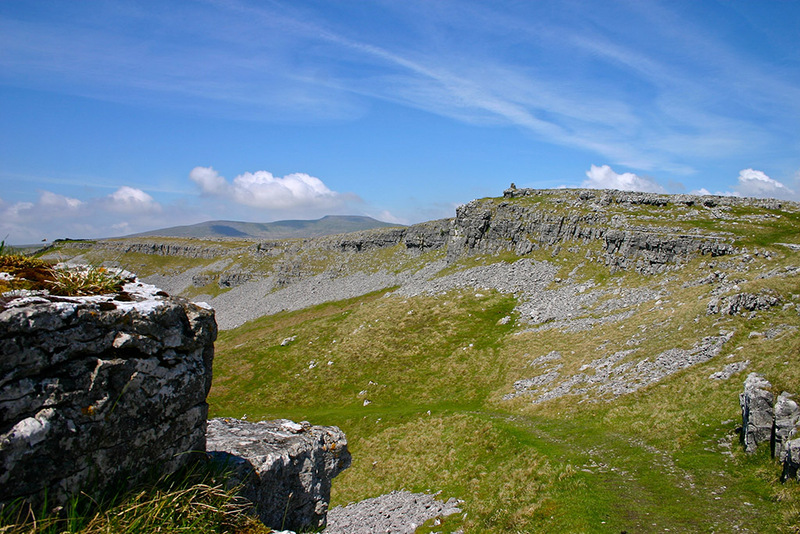 From the falls head up to Winskill then take the path down the Langcliffe side of Stainforth Scar back to the village, enjoying the fabulous views down Ribblesdale. 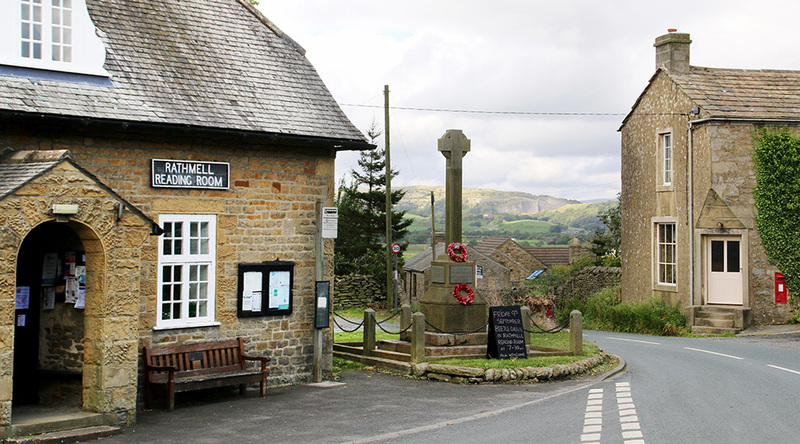 Sadly, Langcliffe no longer has a pub to round off the walk properly but if you do the route on a summer Sunday there’s usually yummie tea and cakes available at the Village Institute (2-4pm). Above and below are a few pics along the journey. 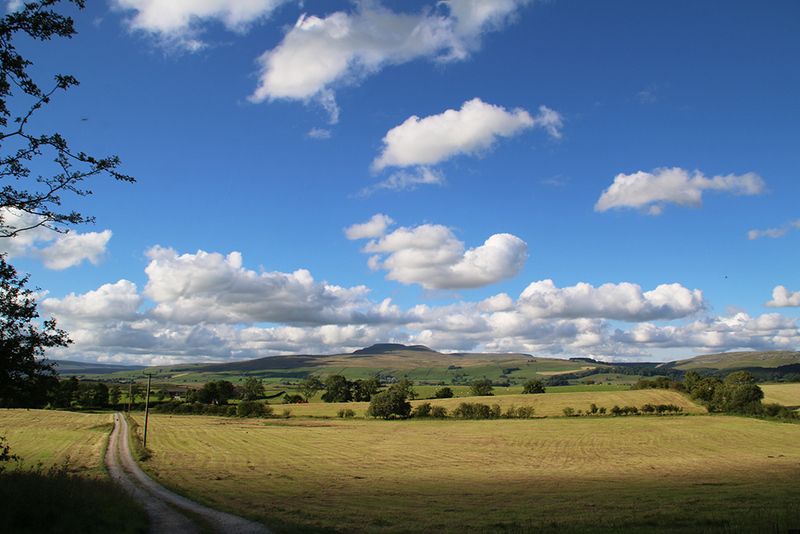 Distant Ingleborough seen from Keasden. 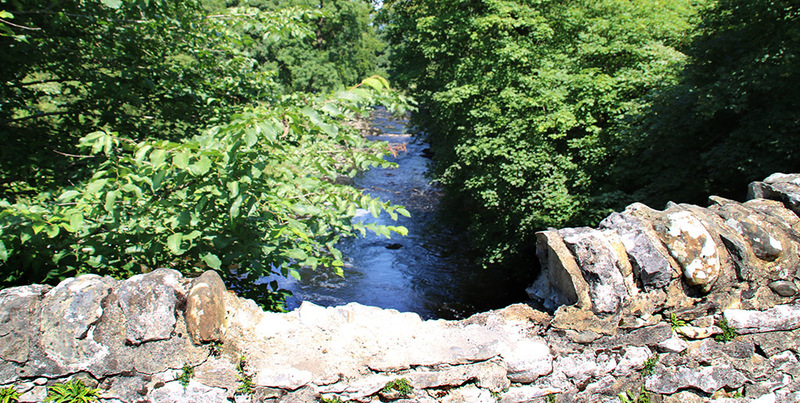 Another chunk of the ancient packhorse bridge at Knight Stainforth has been knocked into the Ribble. I’m presuming a vehicle caused the destruction – when will common sense prevail here? On Friday, not for the first time this year, the electric was off in the village, and it was chucking it down so I didn’t fancy another walk. 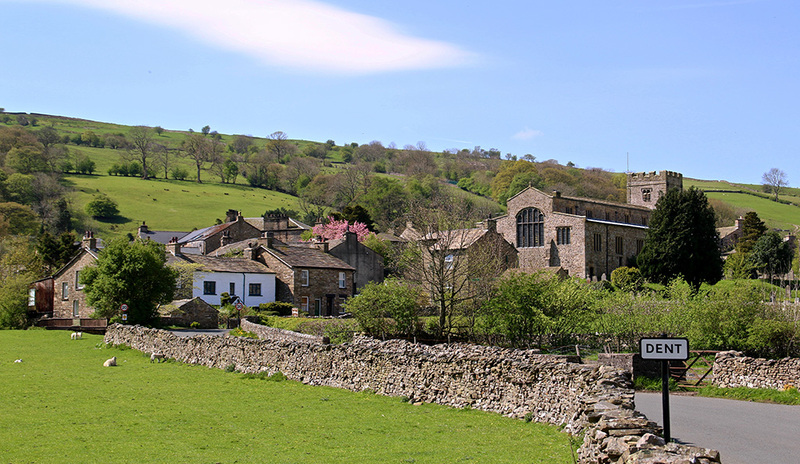 I looked around the house for something to read – nothing new so off I set for Sedbergh and a mooch around the bookshops. Now I’m proud owner of a first edition (1956) copy of The Yorkshire Dales by Marie Hartley and Joan Ingilby. I already have some of their books and I just turned the first few pages when the power came back on. I like the pair’s fussiness and little personal asides which offer a glimpse of their upbringing and lives in the post-war Dales. 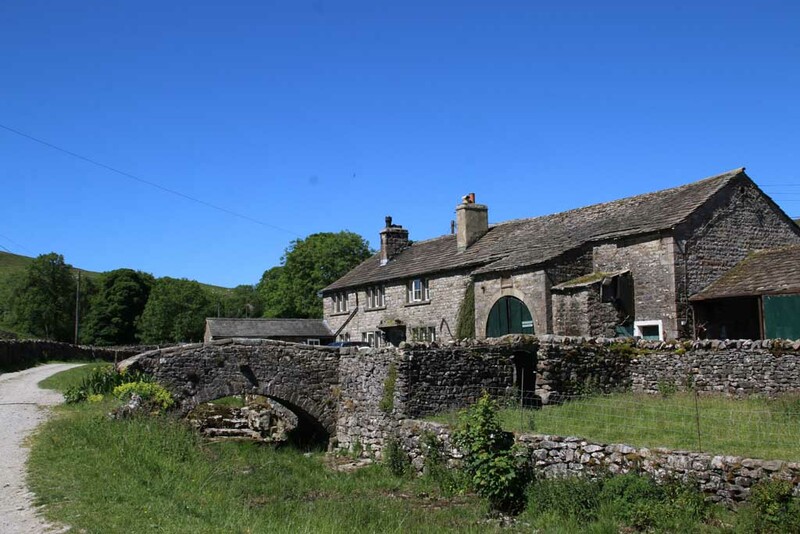 Their observations of Dales life are always backed up with detailed research; they have an authoritative writing style which seems to proclaim ‘we are always right in what we say’! I also love Hartley’s sketches and woodcuts. 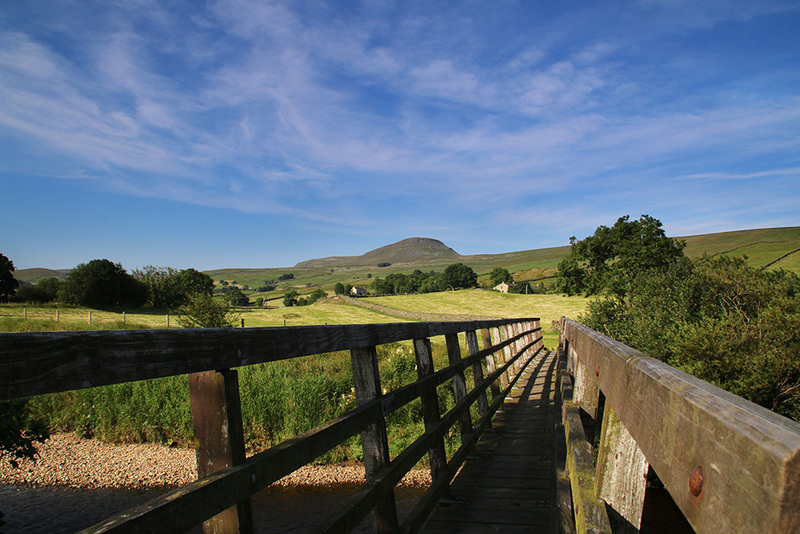 Penyghent from a footbridge over the Ribble near Helwith Bridge. 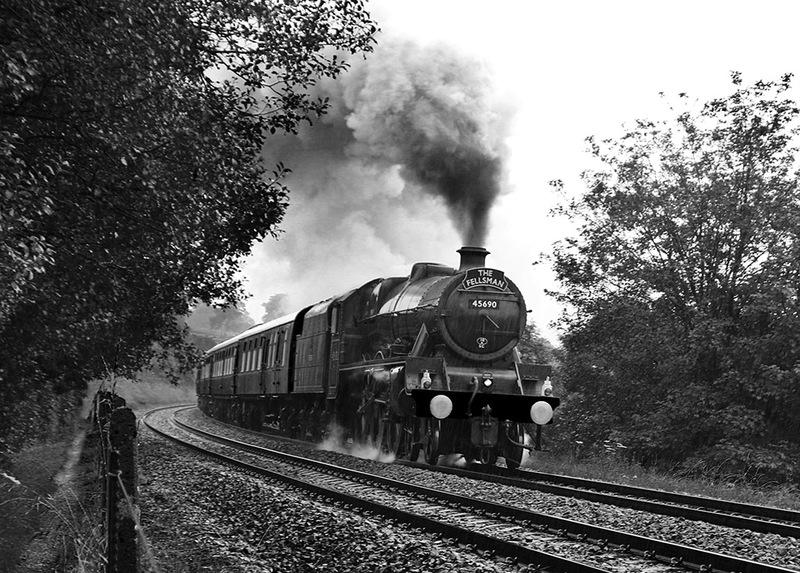 I travel by train as often as I can but it’s not always easy. 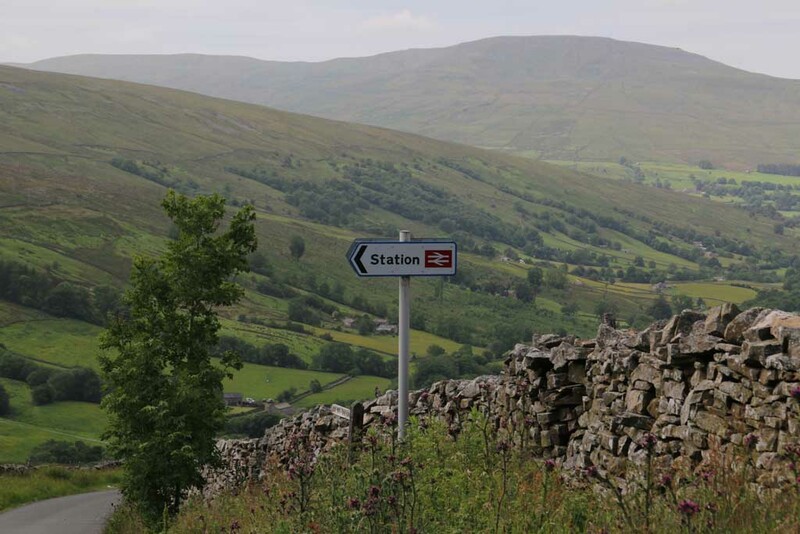 Settle is my nearest station, so invariably I have to travel via Leeds (even if my destination is in the other direction, such as Manchester). Leeds is an hour away, trains are infrequent and the last one back to Settle leaves Leeds at 19.19 (17.41 on Sundays). I’ve been on Settle-Leeds trains when passengers have had to stand the whole journey, and often at Leeds station there is a rugby scrum of people trying to board the service. 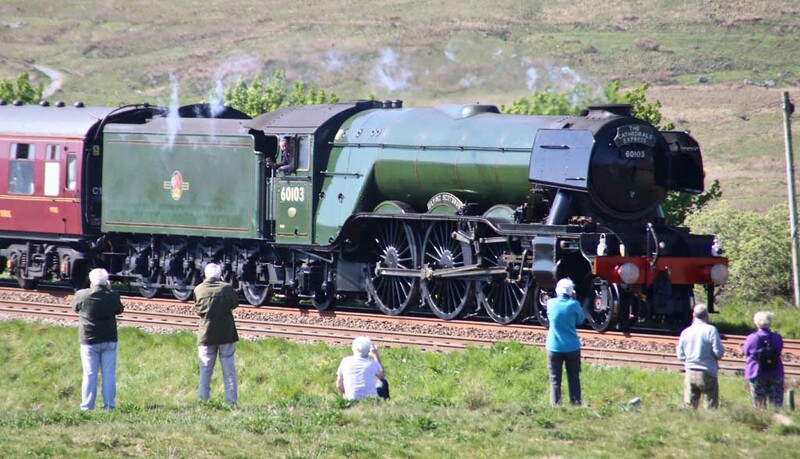 So it is with increasing dismay I see the predicted costs for the new HS2 spiralling out of control. The first phase alone (London to Brum) started at £32bn, then it went to £56bn while latest figures from DfT suggest the cost will double. There’s absolutely no justification in spending so much money when there are far greater priorities in this country. This folly will wreck so much countryside and ruin so many people’s home lives. Spending £100bn+ to knock half an hour off the journeys of those who will be able to afford a ticket is scandalous. HS2 symbolises a country run against the interests of the many and in the interests of the few. 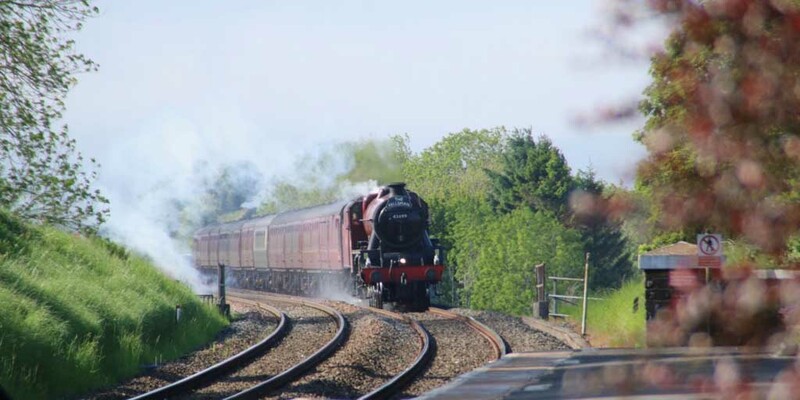 Far less could be spent on creating better local services, restoring old lines and adding to the current ‘low speed’ (apparently 125mph isn’t fast enough) rail network over the next decade. Maybe we should have a referendum on it … oh wait a minute, they don’t work do they. Or how about just letting politicians do whatever they want and have their rich friends pick up all the lucrative contracts, and sod the consequences? 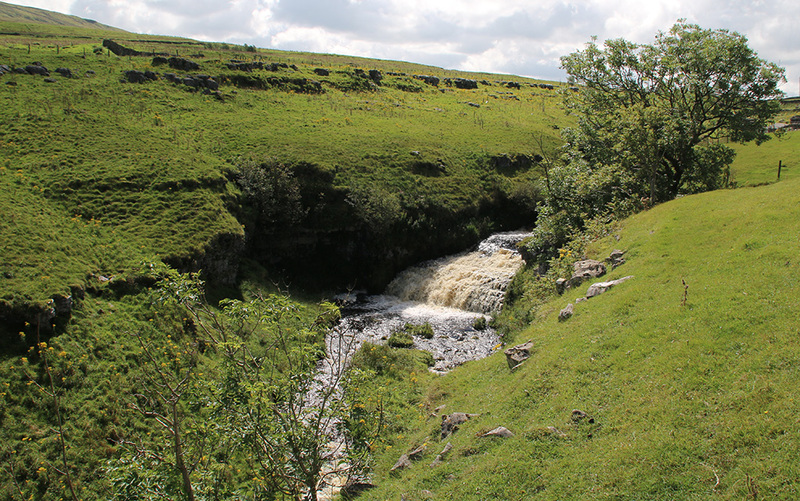 I see that a video of the beck rising in Kingsdale has ‘gone viral’ this week (I also saw on tinternet that the Daily Bile (Mail) described the water’s steady progress as a ‘torrent’- apparently people actually buy this disgraceful excuse for a newspaper). The sudden rise of Dales streams isn’t uncommon. I remember seeing similar happening in neighbouring Chapel-le-Dale. 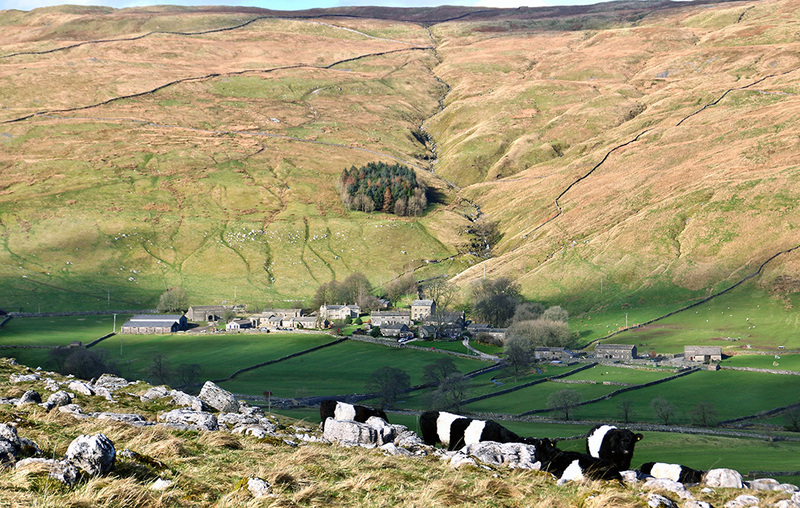 You can witness the Skirfare suddenly appear in Littondale when rain soaks the surrounding hills. 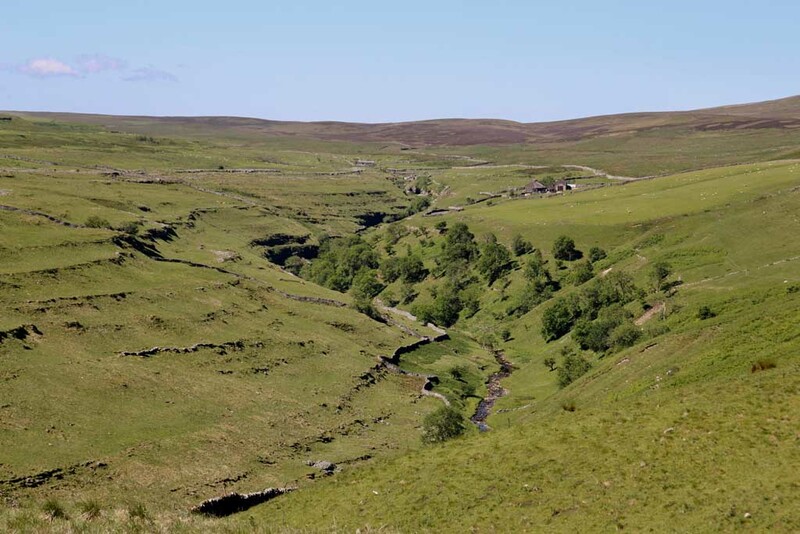 Also, near Cowgill at the top of Dentdale the dry bare rocks on the bed of the River Dee can instantly turn into cascades. 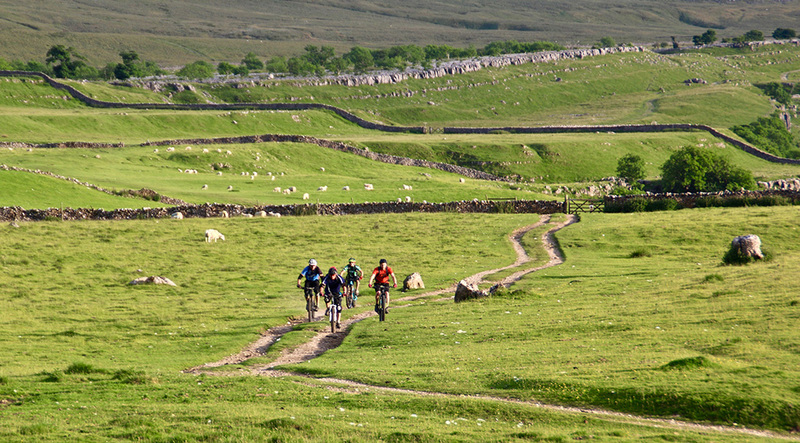 Still a cracking video though – gotta love the Dales. 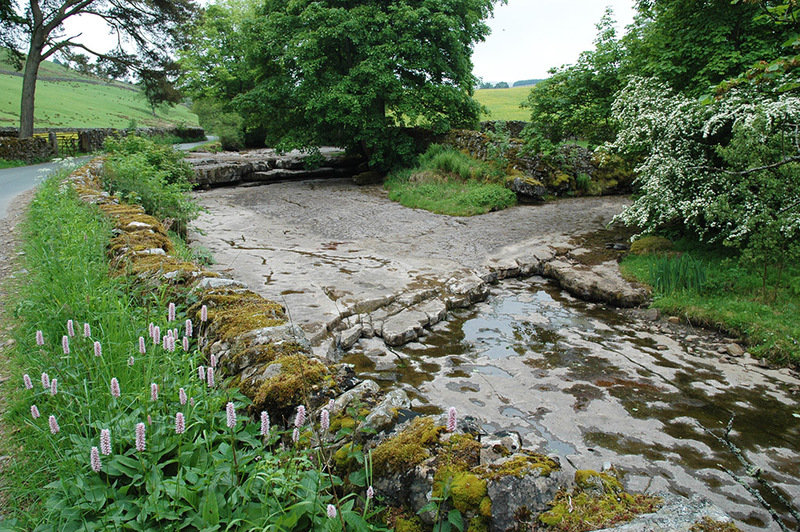 The dry bed of the Dee near Cowgill. 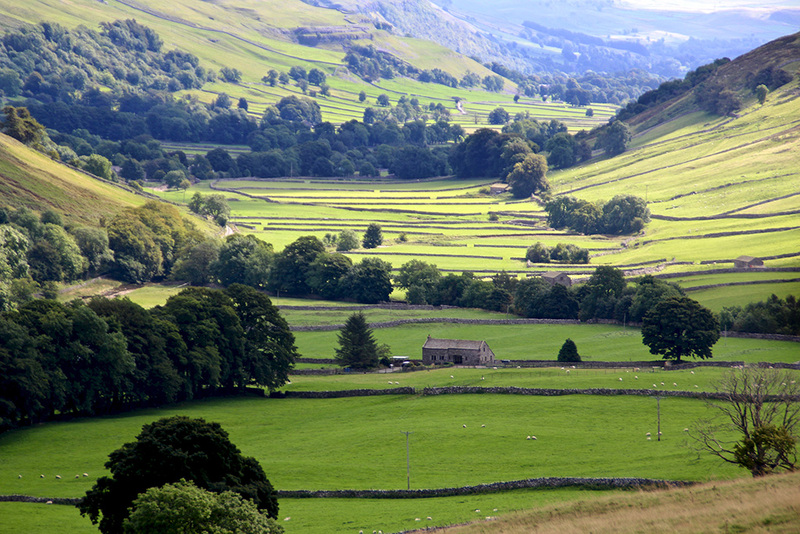 Yorkshire Dales: 13 new photos here. 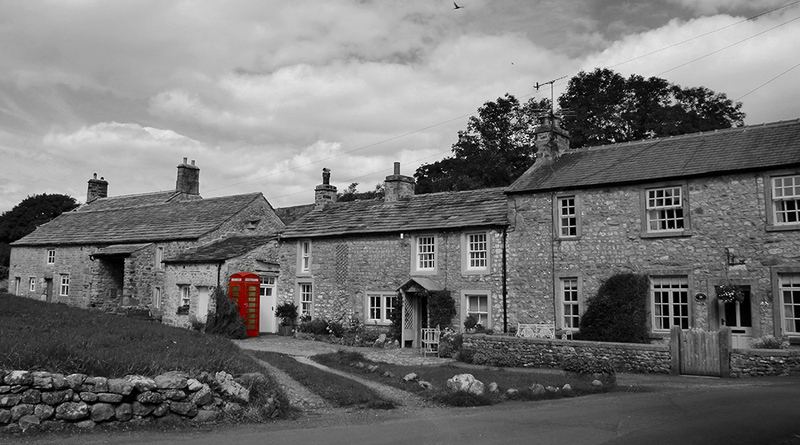 I can find art that appeals to me almost anywhere I go in the Dales. The top picture is my kind of art – not the calibre of photography, which leaves rather a lot to be desired, but the view; Humans and Nature acting as one to create a beautiful experience. Okay, not to everyone’s taste, I know. 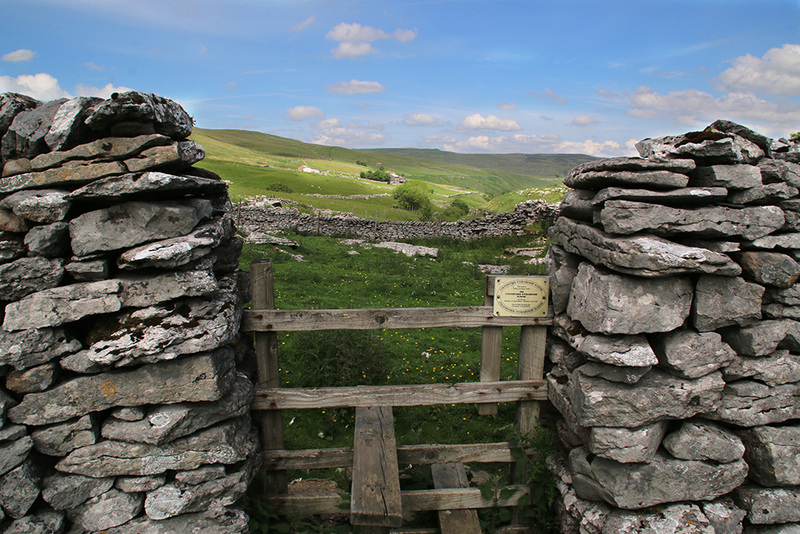 But when you take the time to stop and frame a small part of the Dales landscape you can sometimes find a masterpiece. 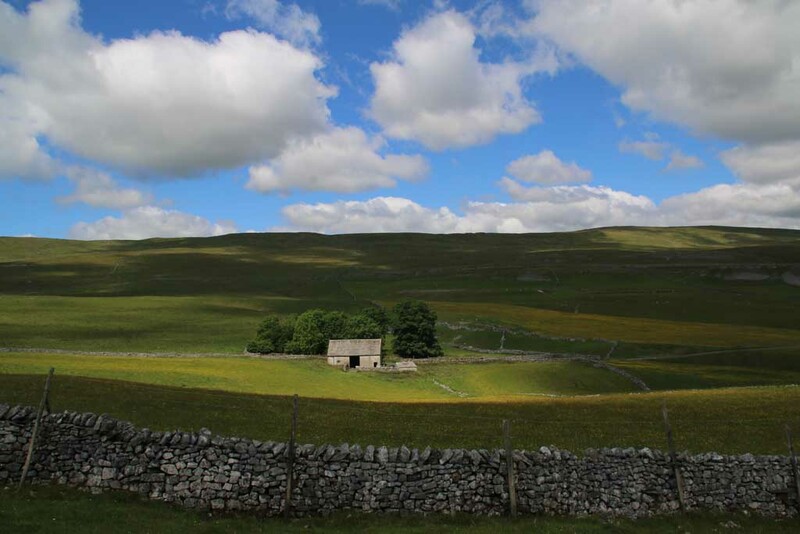 The scene is in Little Stainforth, a couple of miles up the road from my Ribblesdale home. Art turned out to be a bit of a theme this week. 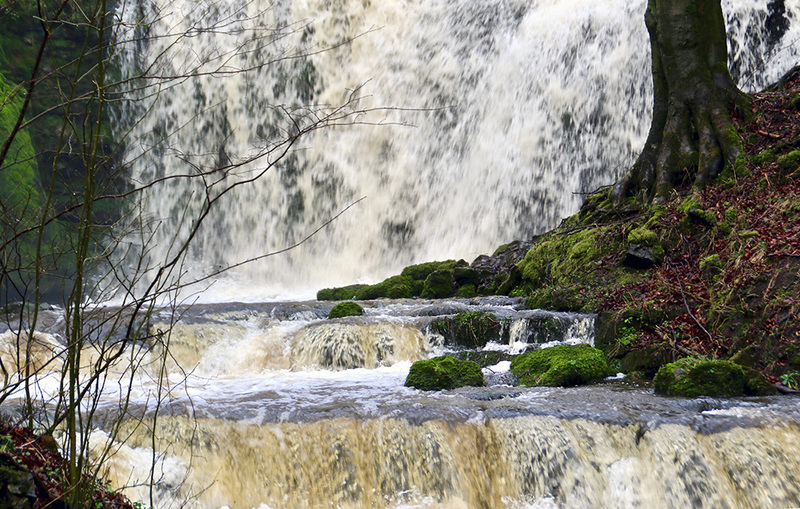 Last Sunday after the deluge I travelled out of Settle to Scaleber Force (pictured above) which was looking and sounding dramatic. 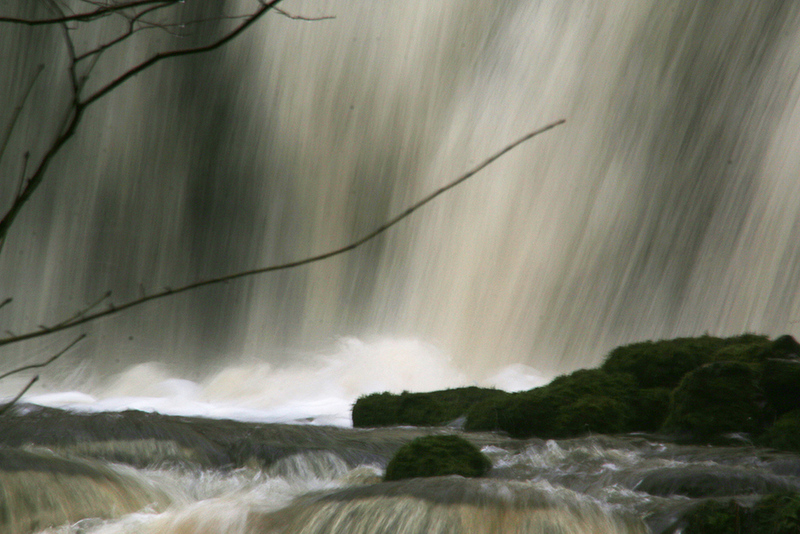 Besides taking a few predictable shots of rushing water I closed in for a couple of more artistic shots. I’m getting daring in my old age. 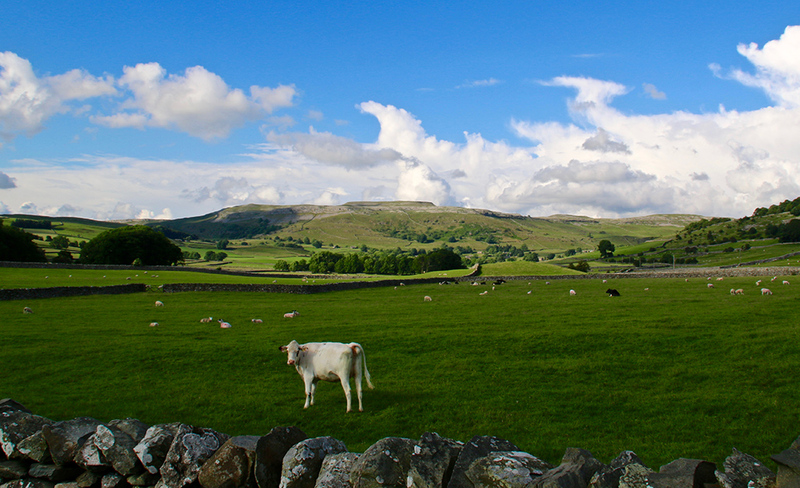 The sky cleared over the Dales the following day, tempting me out for a drive over to Littondale. 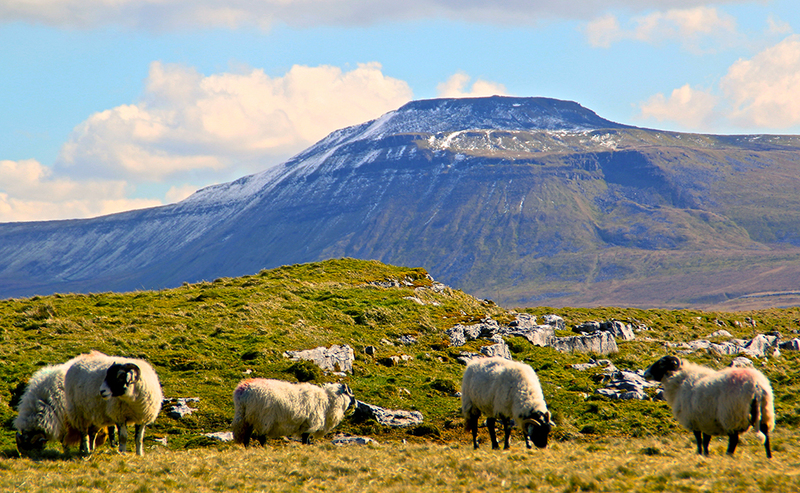 Penyghent looked a picture and Belted Galloway cattle, looking like escaped pandas, provided an interesting foreground. 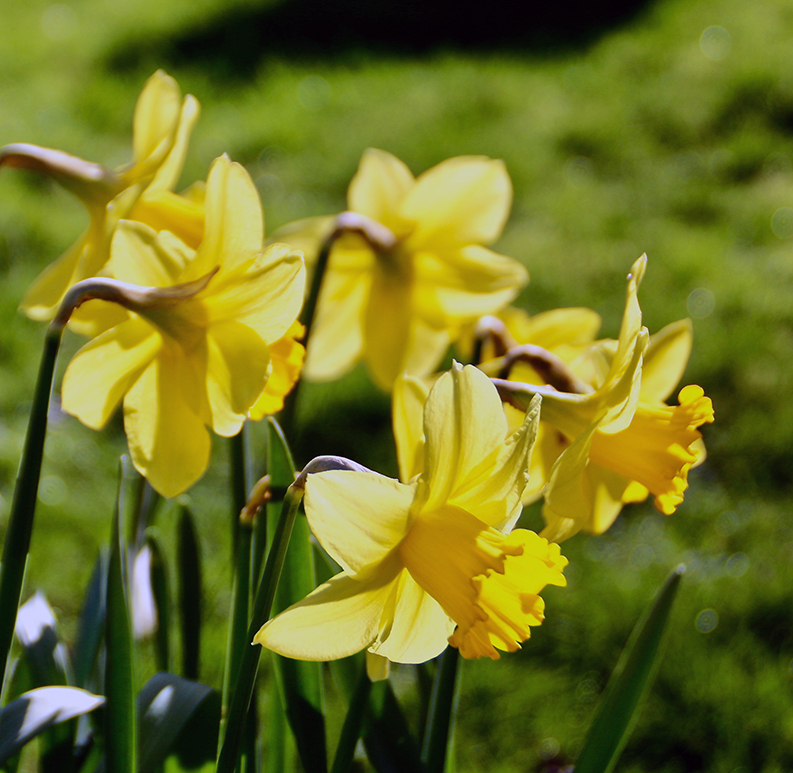 Daffodils soaked up the sun in Langcliffe churchyard and on the village green. 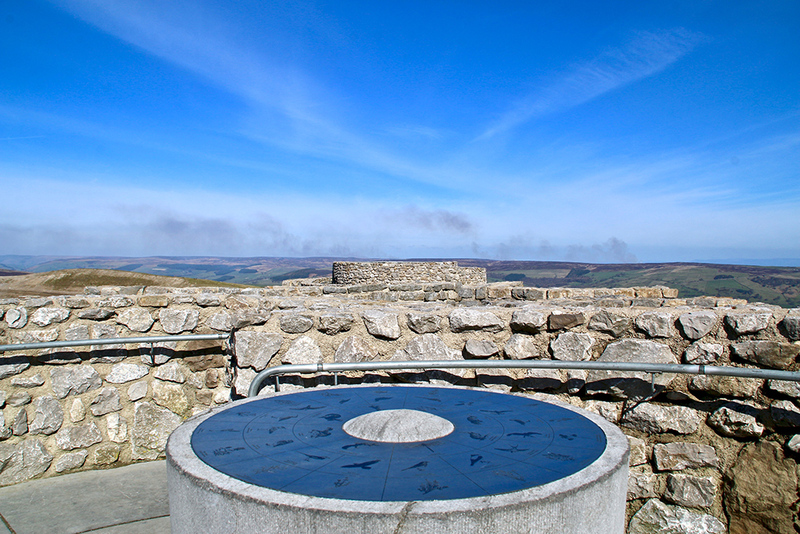 In 2010 I represented Dalesman at the opening of the Coldstones Cut sculpture (partly pictured above) near Pateley Bridge. 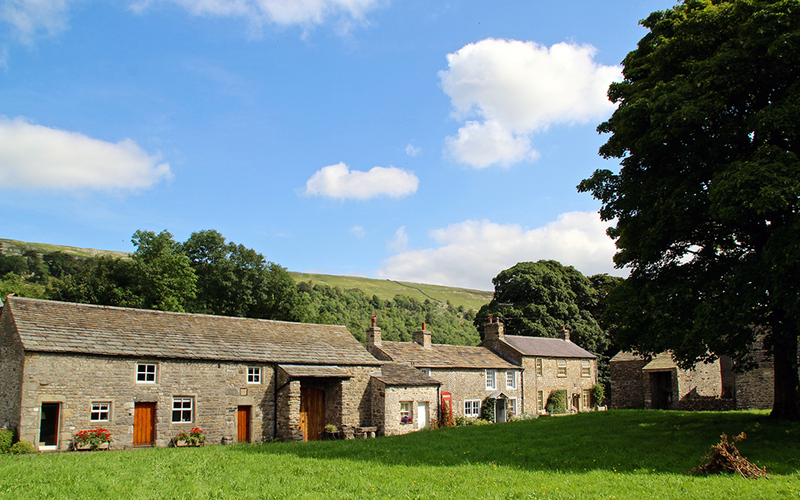 Here, urban meets countryside, tourists meet workers. 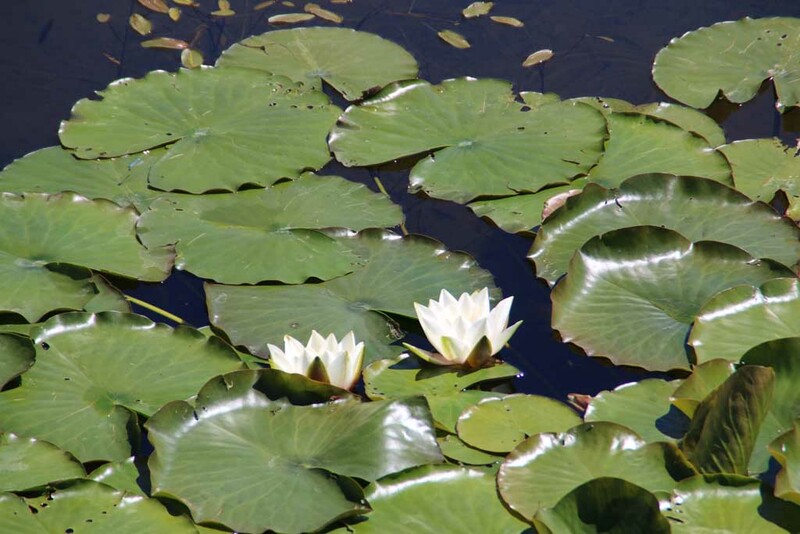 It’s an unusual space which challenges the senses. 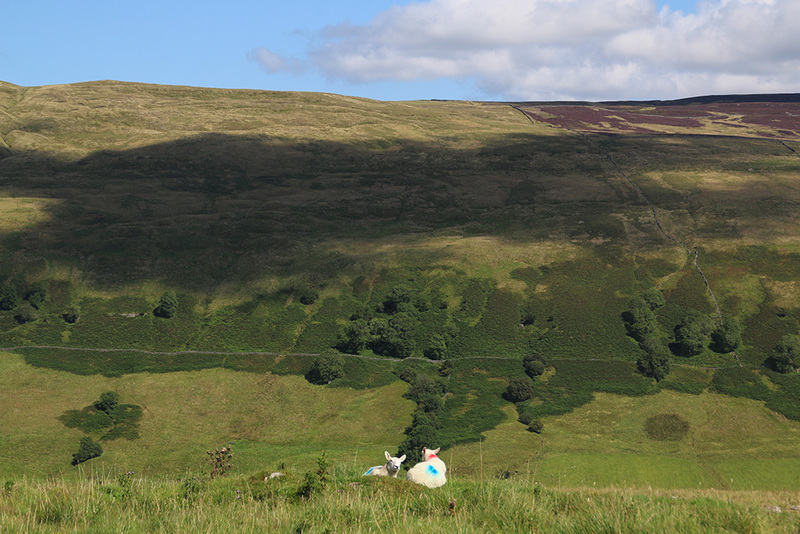 I went back there this week for a reminder of this unique piece of Dales art. 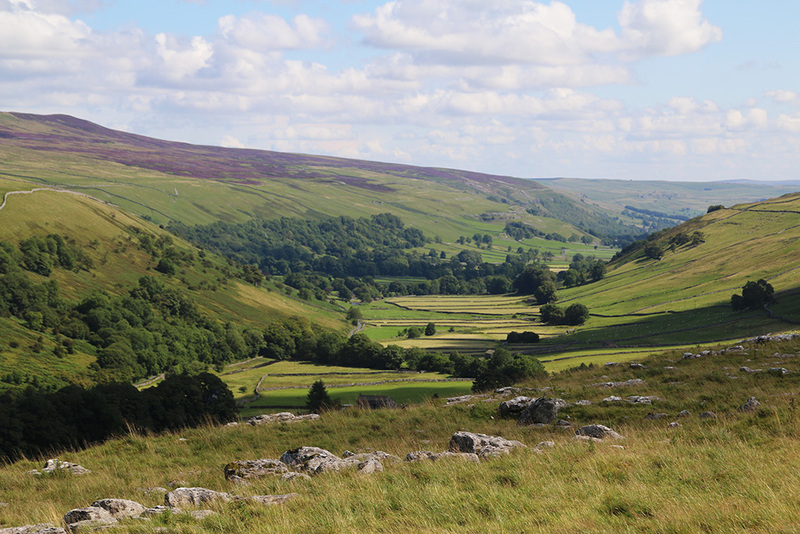 To the east Nidderdale’s glorious landscape stretched out; burning heather sent smoke across the otherwise clear blue sky. Turning north, Great Whernside carried snow on its shoulders while to the west quarry workers were digging deeper and deeper into the Dales. Looking south the great golf balls of Blubberhouses early warning site were keeping an eye on Mr Trump’s imaginary enemies. 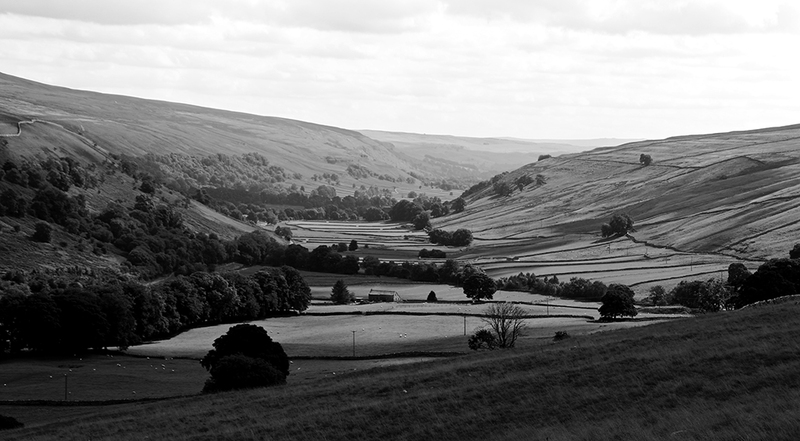 I think I developed an RSI problem with my camera clicking finger while photographing the Dales this week. 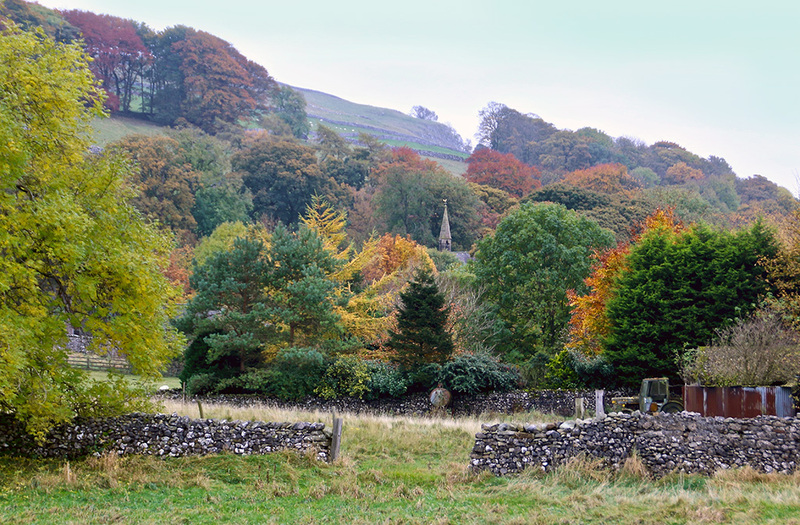 Trying to capture what I believed would be the last of the best autumn colours I’ve driven many a mile through many a dale and taken many a picture. I won’t bore you with the full collection but here are some highlights plus a quick rant. The top photo is my favourite of the week. 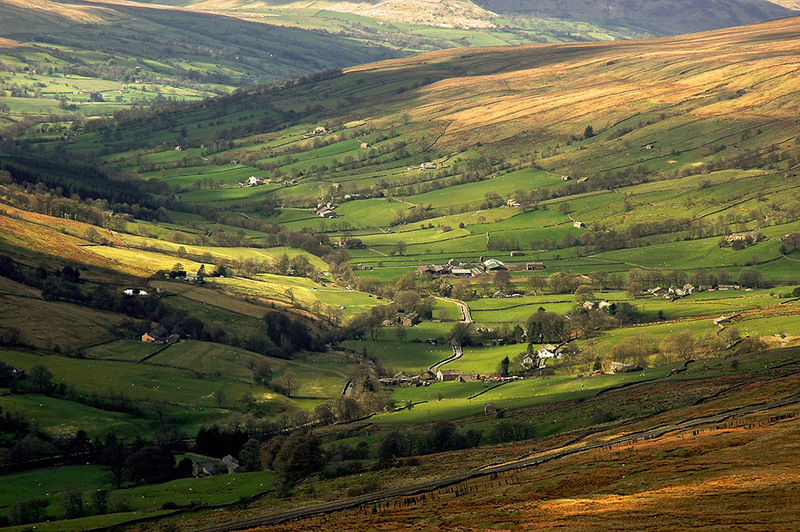 On Monday, reaching the highest point of Buttertubs Pass coming from the Swaledale end, this view opened up. 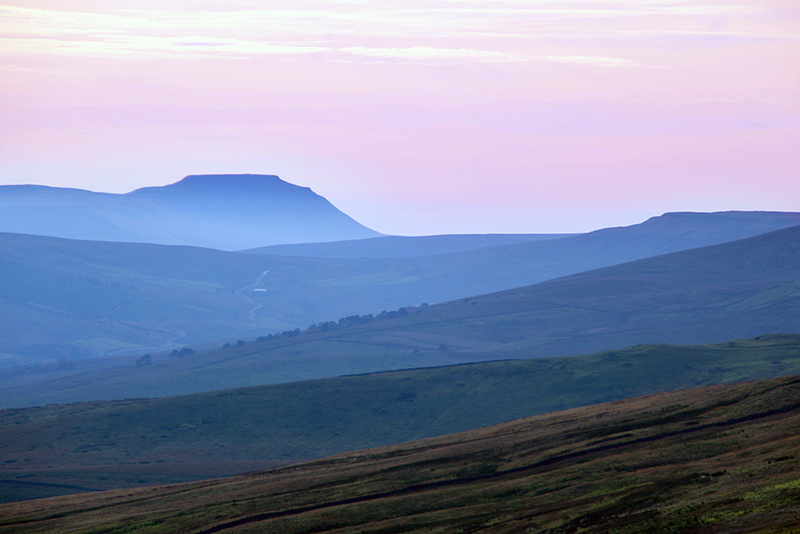 It’s a bit of an unsteady hand-held zoom shot showing a distant Ingleborough, Widdale and hills in between. The light autumn mist in the dales and a mild pink sky created a beautiful sight. Better seen first hand than on a screen. 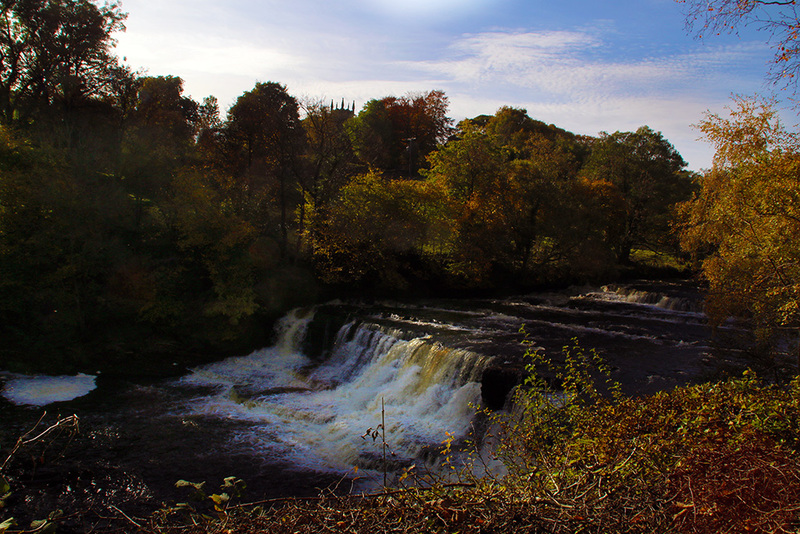 I took dozens of photos at Aysgarth of the falls and the Ure. These are some I didn’t post on my Twitter account. 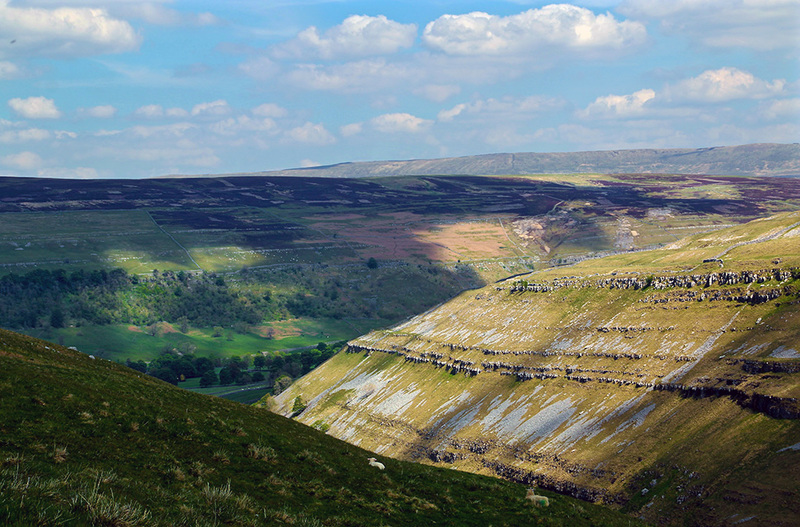 From wide Wensleydale into narrow Swaledale which looked stunning. 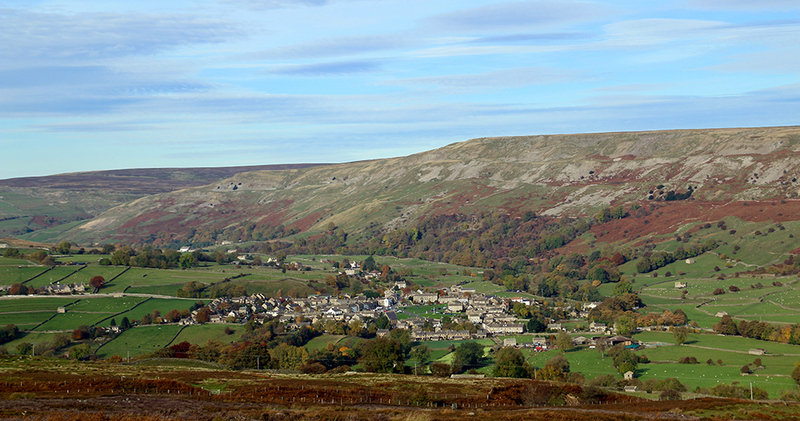 Reeth, Gunnerside and Muker were a picture in their autumn garb. 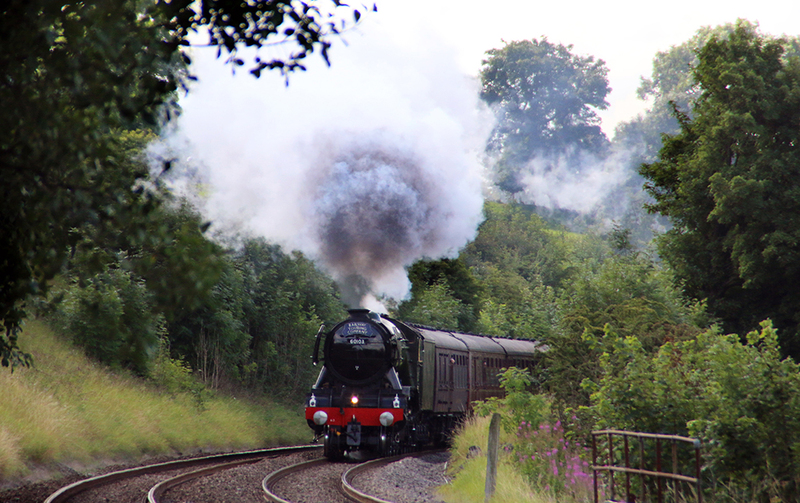 I know, I’ve taken this shot umpteen times but it’s one of my favourites and it’s my blog so I’ll do what I want. 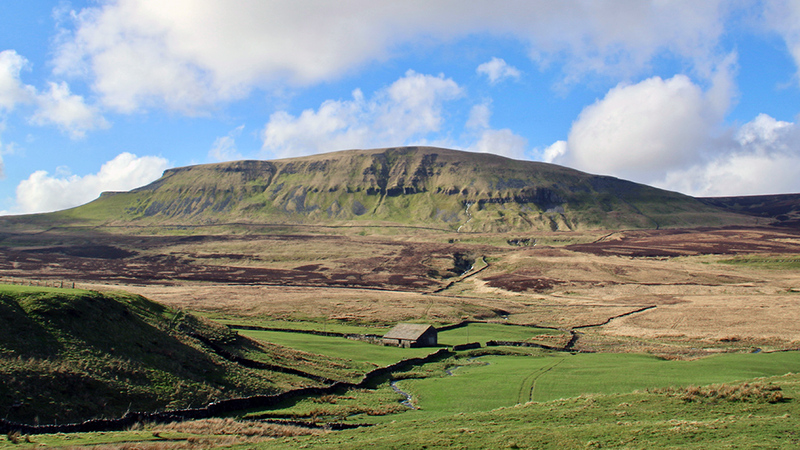 Dale Head Farm and Penyghent. If I had the brass I’d help the farmer finish off that barn roof – it would make a lot nicer shot! 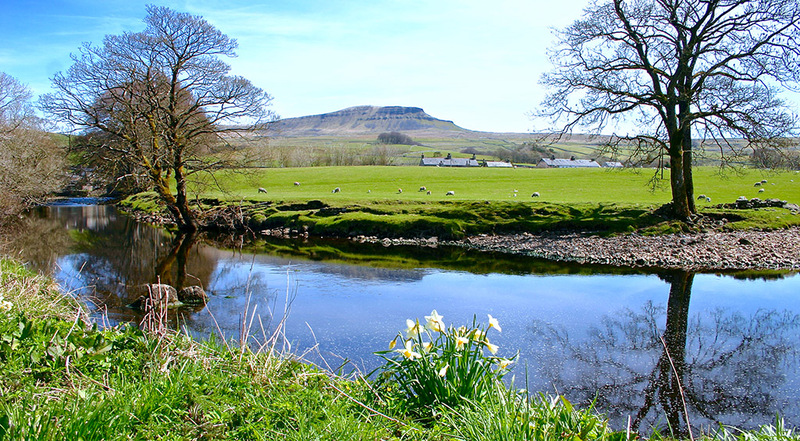 Ribblesdale: my weekly walk into Settle market on a Tuesday along the Highway from Langcliffe. At first I thought they were a Trick or Treat prank. But no, they were still in place the following day – I’m talking about those ghastly luminous yellow double-lines that now disgrace Settle’s lovely town centre. I’m in favour of preventing stupid parking but this vandalism is well out of proportion. 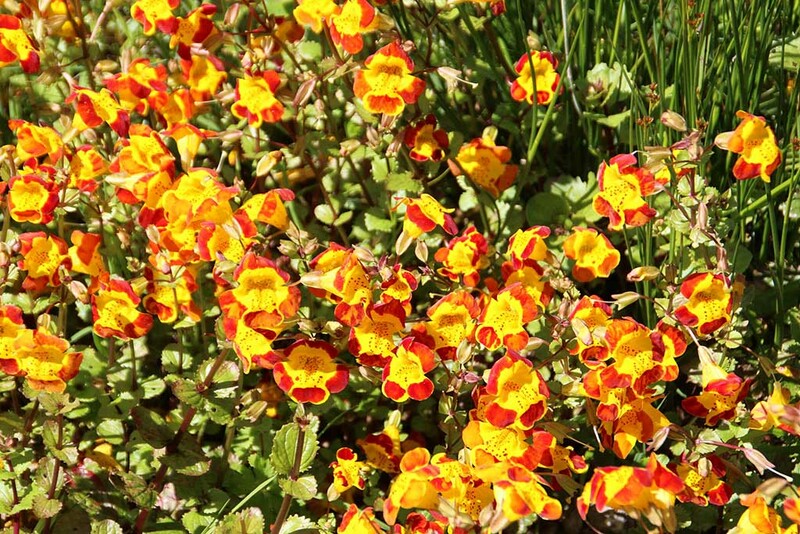 They are garish, ugly, unwelcoming and urban. 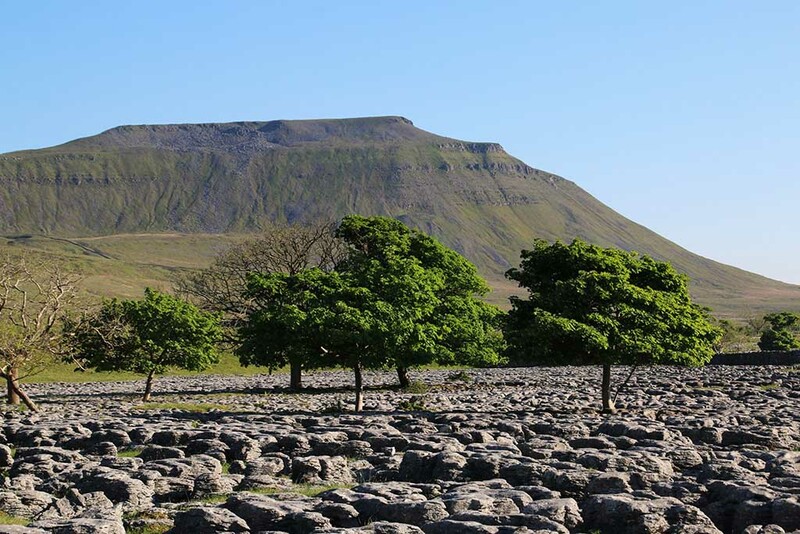 They can be seen from the surrounding hills and the Dales National Park, and probably from the Moon. I’ve been to other popular country places where a subtle thin line with appropriate notices about parking restrictions have satisfied the law, suited the town’s character and appeased the residents. Had some yobs daubed such graffiti in the town there would have been an almighty Halloween witch hunt. Which bureaucrat sanctioned this unsightly mess and why? Sorry about that Daily Mail reader rant but I really do find this particular excessive painting offensive and unnecessary. Another shot of the kiosk in Arncliffe. 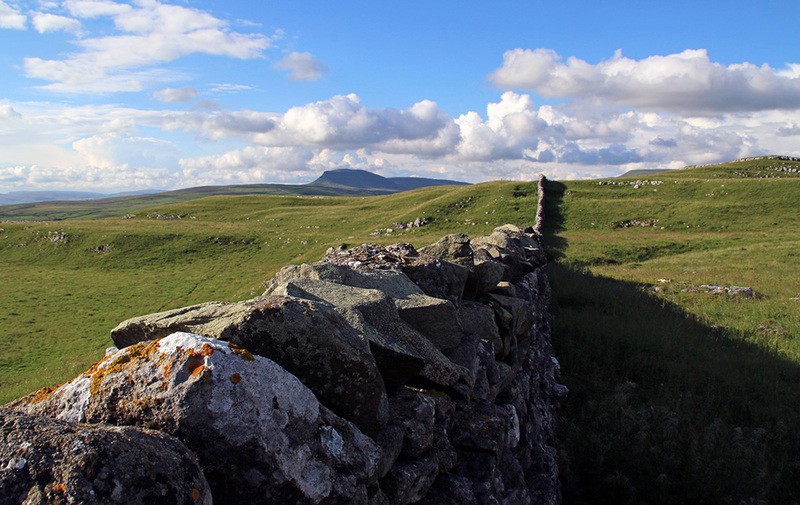 Looking towards Penyghent from the Silverdale road at Dalehead Farm. 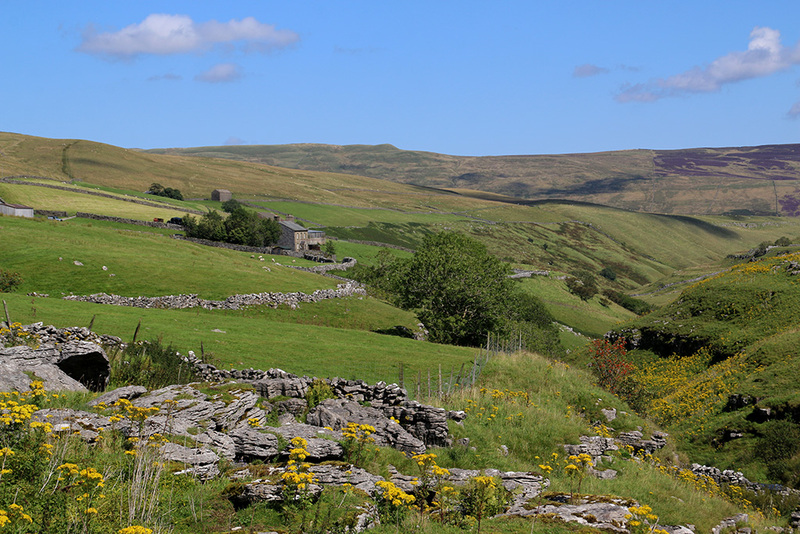 Further along the road to Halton Gill at the ‘backside’ of Penyghent. 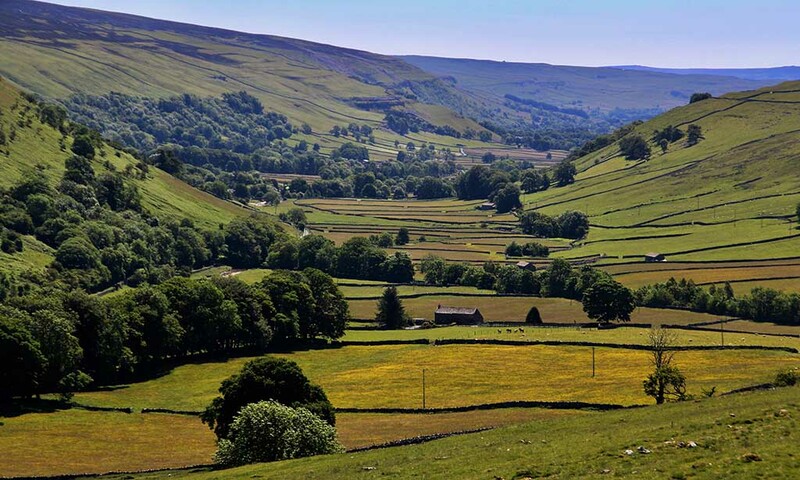 The breathtaking Dales view down Littondale. One of my favourites. 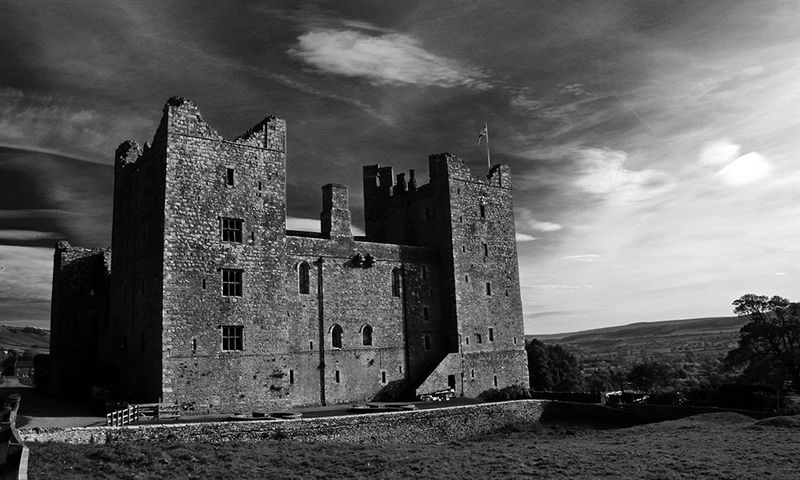 I like it so much here’s a black and white shot. 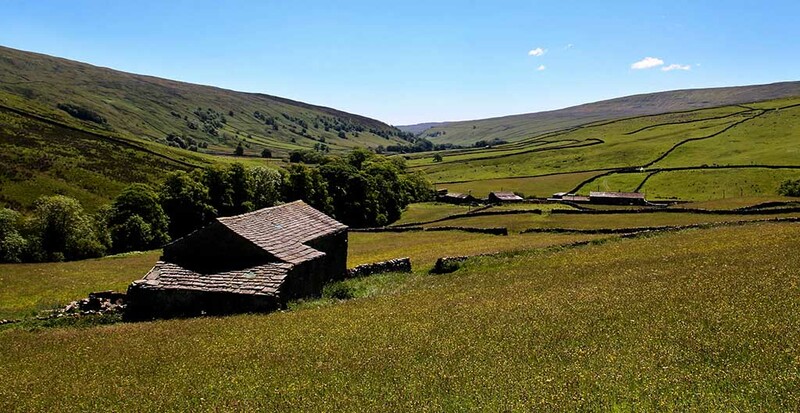 Little Halton Gill snuggles between Littondale’s steep hills. There are some fascinating tombstones at St Oswald’s church, Arncliffe. 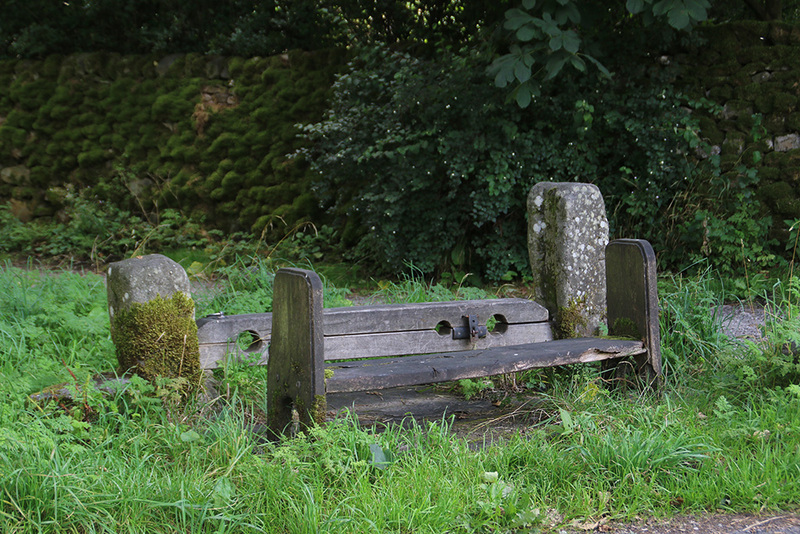 Bring back the village stocks, I say. Not enough time for me to list who I’d throw rotten tomatoes at. 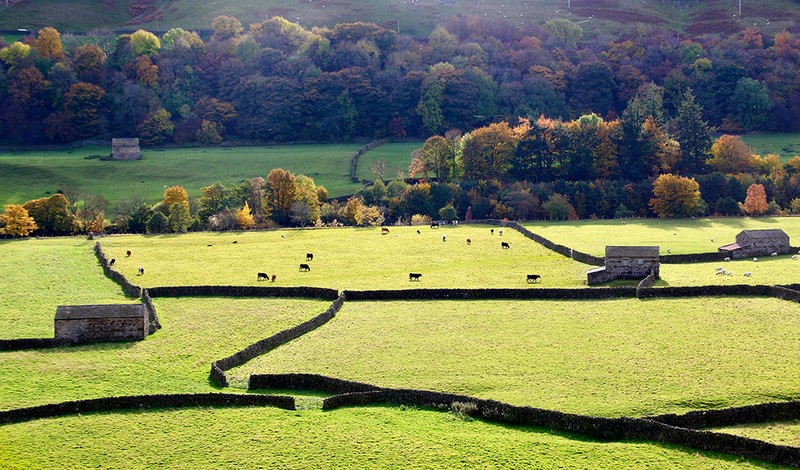 Arncliffe. 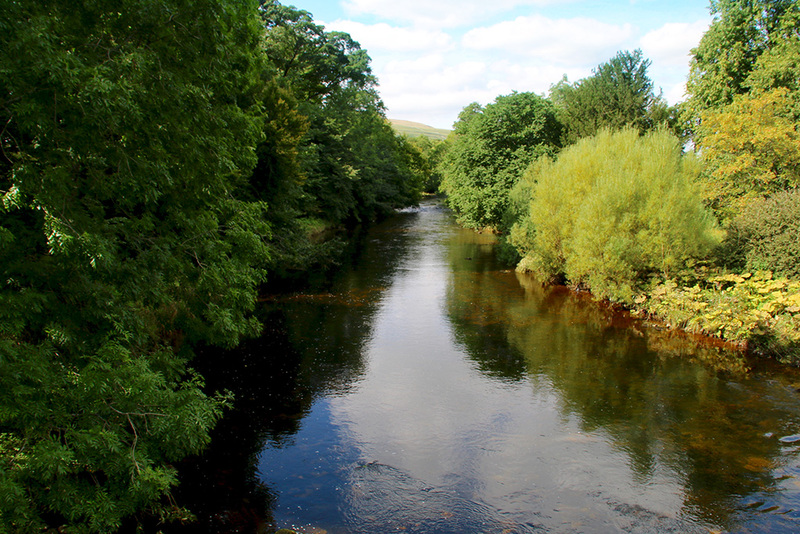 It’s not always as tranquil as this in the Dales – the river Skirfare near St Oswald’s in Arncliffe. 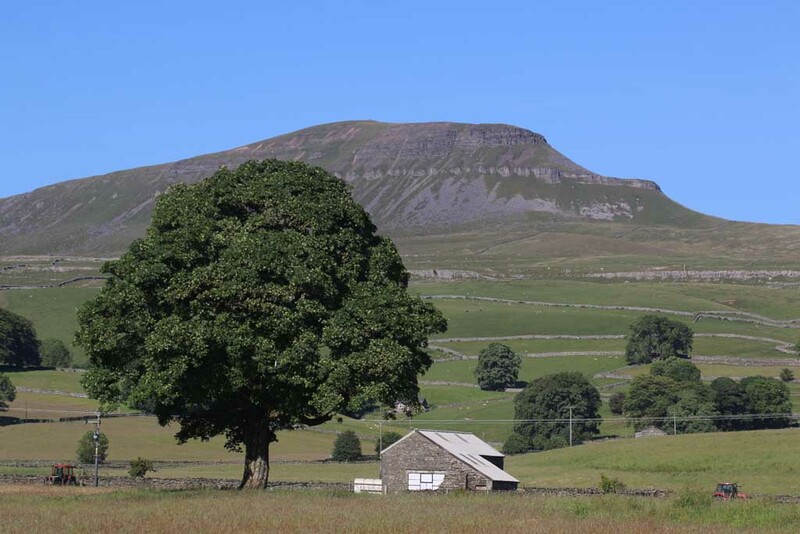 Whenever I drive through Rathmell in Ribblesdale, as I did one day this week, I wonder about the origins of the term ‘Reading Room’. I realise it is the equivalent of a village hall but why was it so called? Is it a Dales thing? 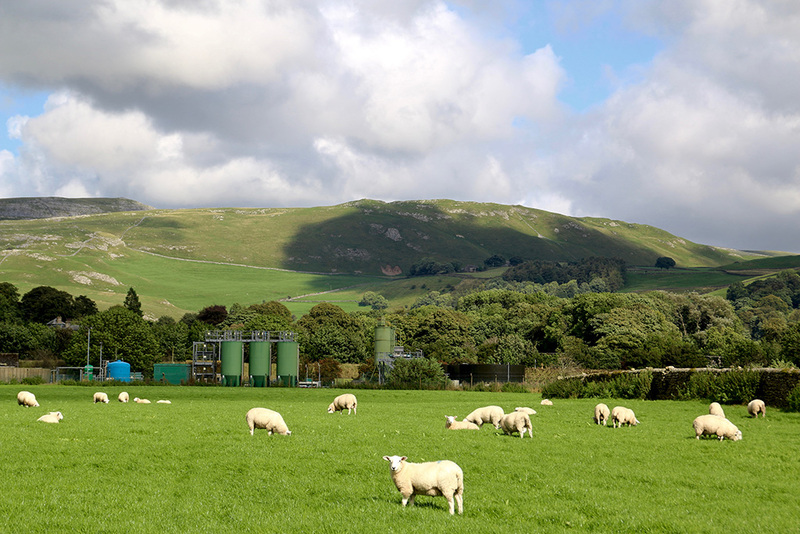 I don’t know what happens at the treatment works by the Ribble here in Settle but those ewes certainly look to be thriving on it. 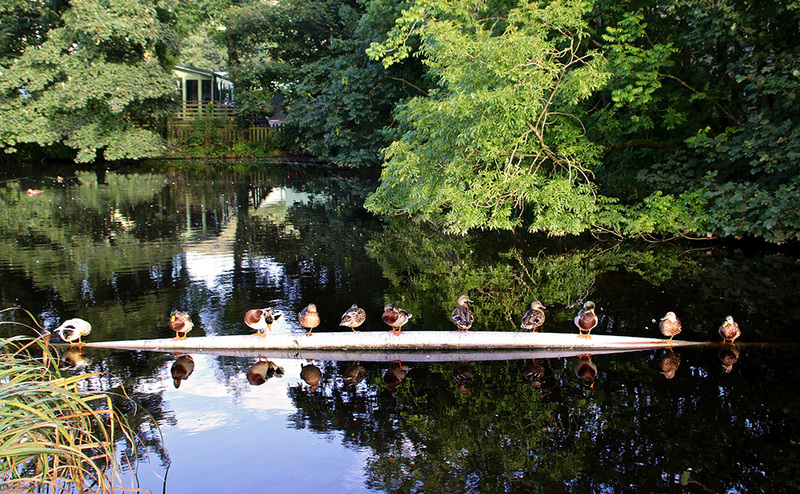 Team photo: Millpond Ducks FC first XI line up for their latest match in Langcliffe. Yesterday I thought I’d take one more summer shot at Langcliffe Locks before the trees change colour. Earlier in the week I dropped in at Clapham Falls where there was already more than a hint of autumn. 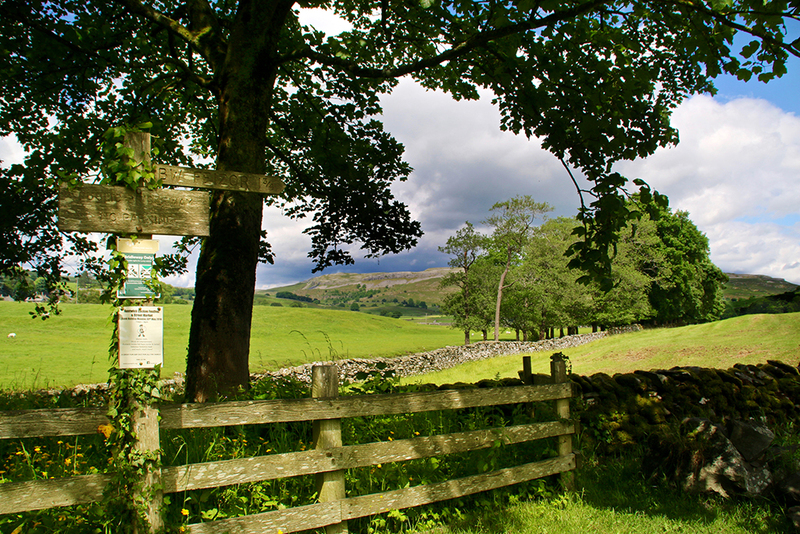 The long days this week have created some great lighting for photography in the Dales. The best times have been in the evenings – which has was good for me as I’ve had a busy time during the day at my computer. 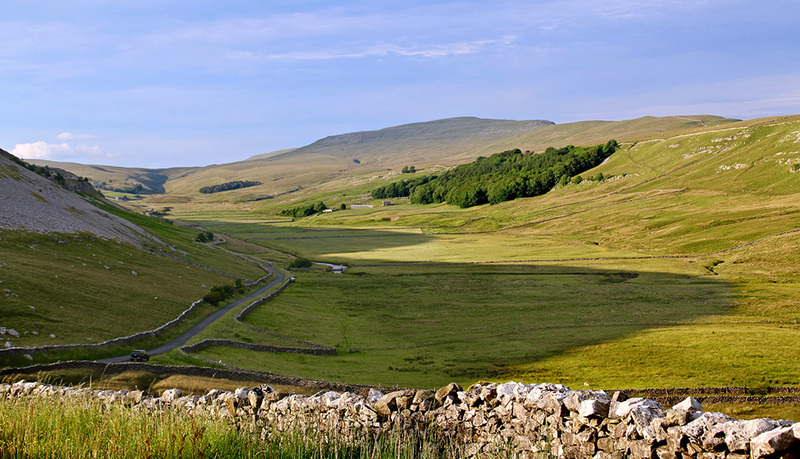 Locally I’ve driven the short distances to Kingsdale, Chapel-le-Dale, Crummackdale, Silverdale and Littondale – and of course Ribblesdale. 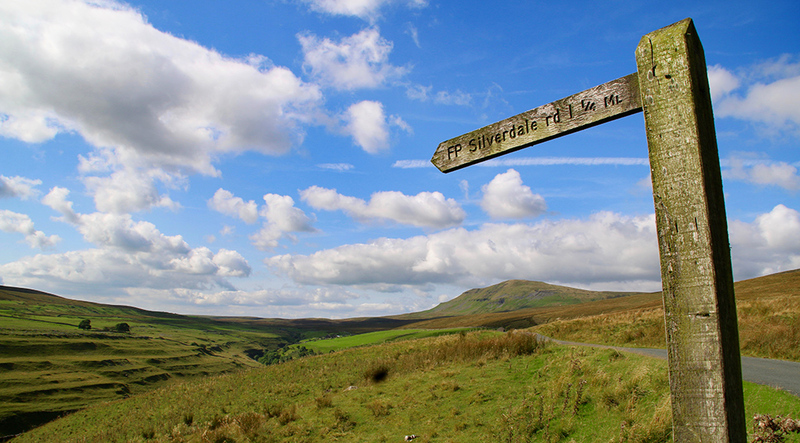 The Three Peaks proved once again to be perfect subjects as they caught the late sunshine. They seem to be dozing like three sleepy cats after a hard day’s play, keeping their distance from each other but still having a wary eye on what’s going on. 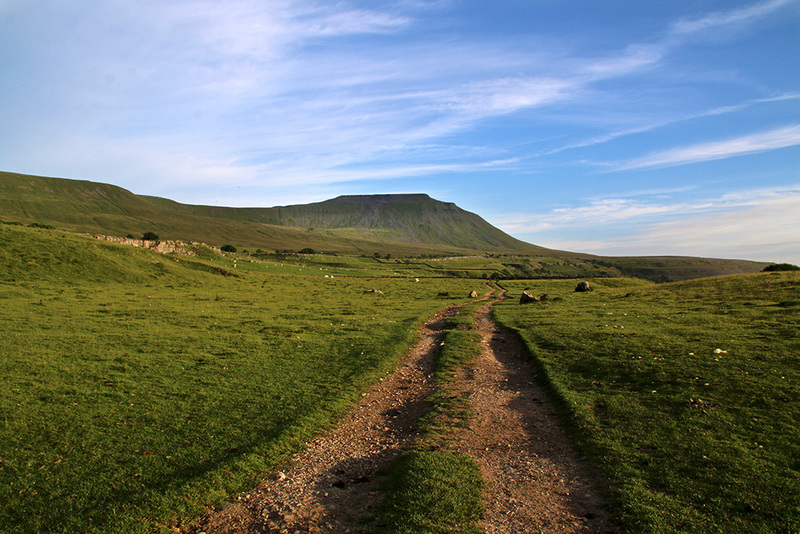 Fantastic, too, to see people enjoying the extra daylight – I’ve encountered road cyclists, walkers, runners and on Thursday evening around the massive bulk of Ingleborough, mountain bikers and paragliders. 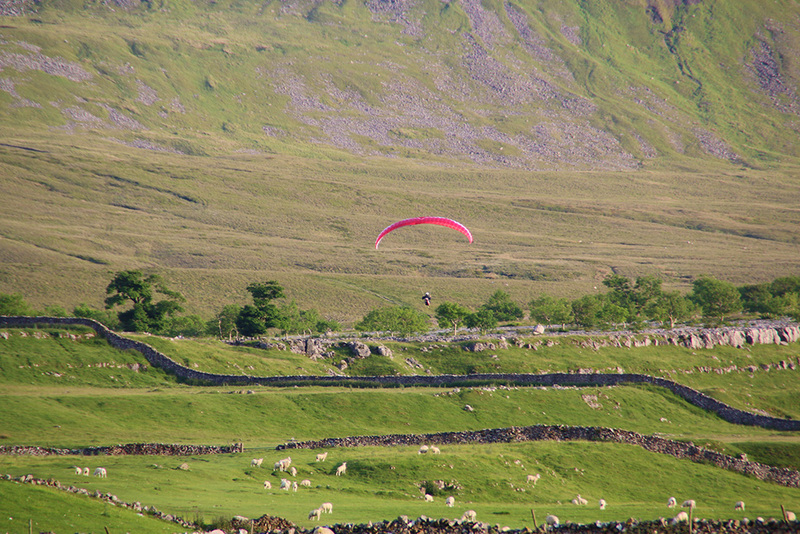 (A strange aircraft with propellors flew low over the top end of Ribblesdale as I drove home on Thursday evening. 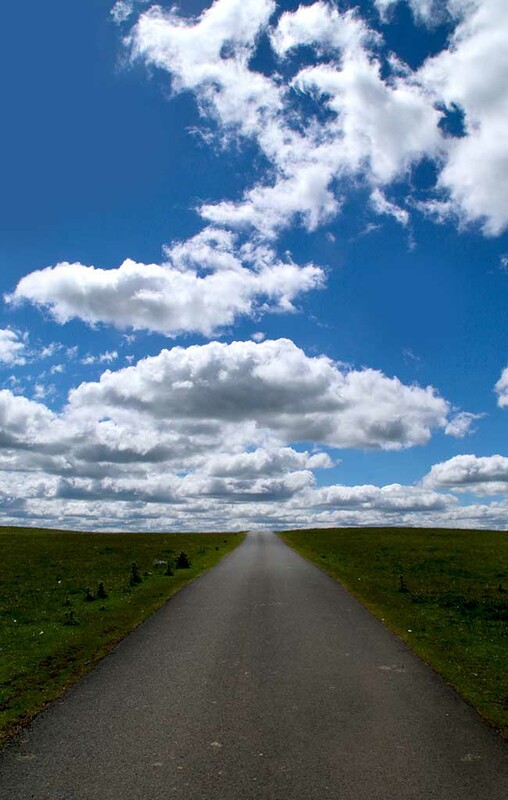 Even I don’t take pics while driving – so did anyone else capture it?). The top shot I’m calling ‘playing with light’. 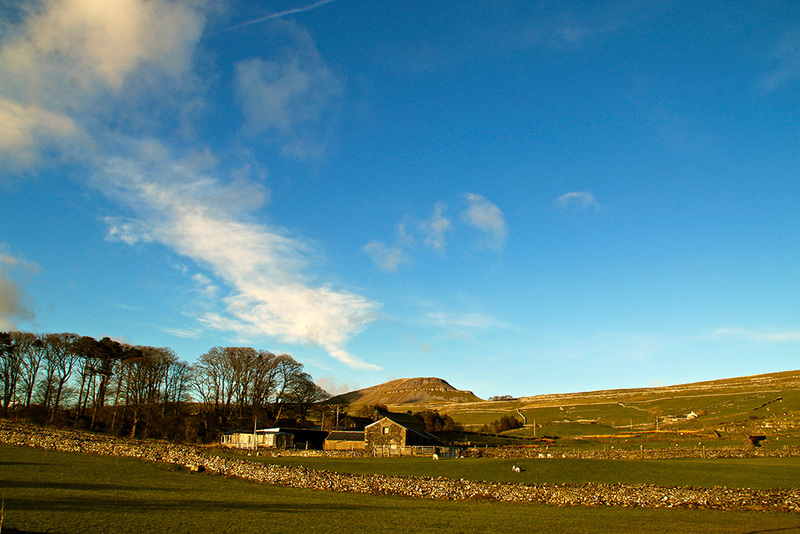 It shows patchy late evening sunshine over Ribblesdale. 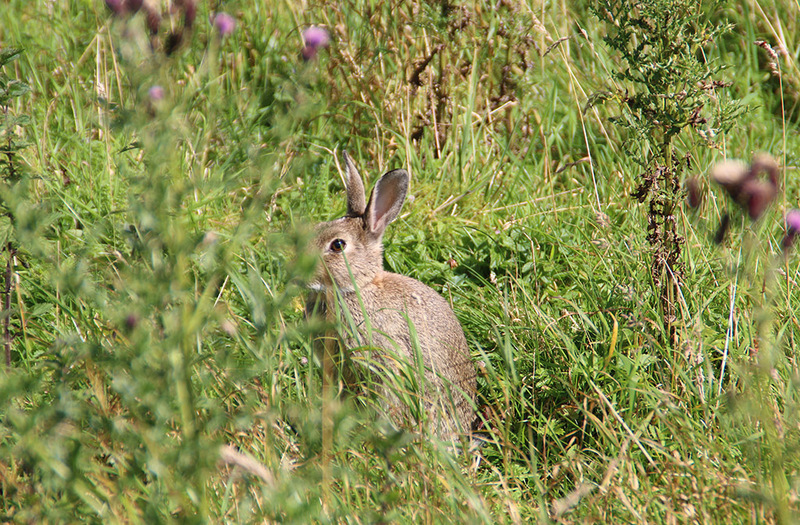 Other evening shots are spread throughout the blog. One of my favourite pastimes is watching other folk work while I laze about doing nowt. 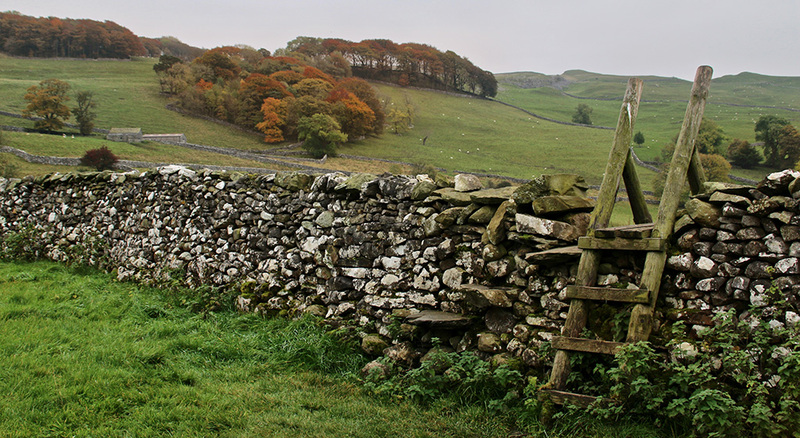 I was leaning on a wall one day this week near Austwick, admiring the Dales view; nearby, two chaps were putting up a timber fence around a small thicket. I couldn’t tell what wood was being used but it reminded me of an old country proverb I once included in Countryman magazine www.countrymanmagazine.co.uk when I was editor. It went something like: ‘If you build a fence of elm you can forget it for 20 years. 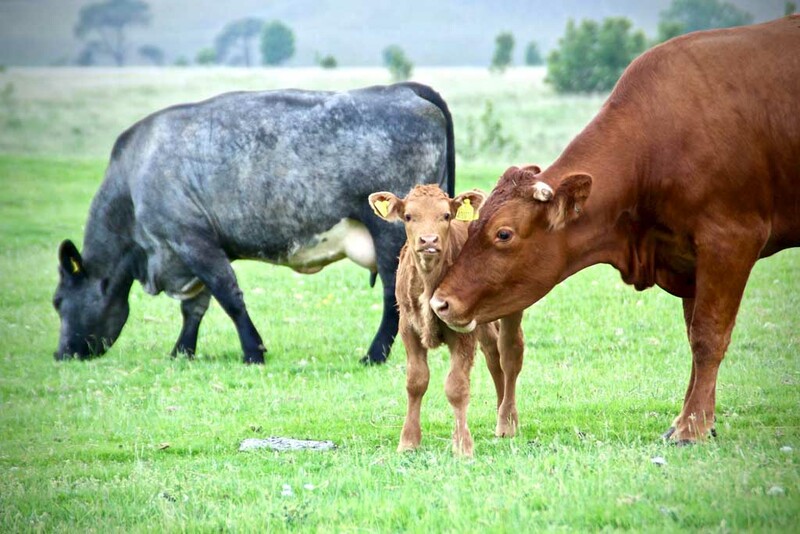 If you build it with oak, you can forget it’. A timely reminder that what we do today affects what we’ll need to do in the future. It’s been a week for contemplating life hasn’t it? 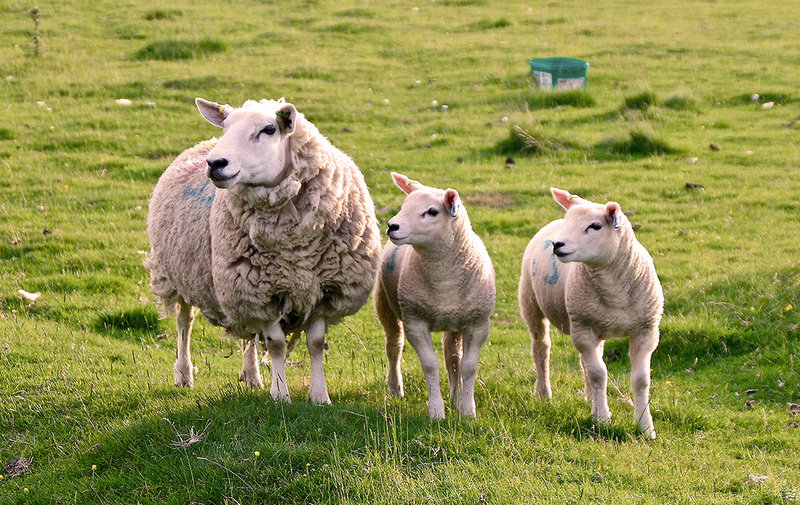 While sitting on a small hill during a short spell of sunshine in the Dales on Friday evening I watched several sheep wandering aimlessly around a field. Which one was leading the gang was hard to fathom; maybe they all believed the one with the dodgy hairdo, or the one with the loudest baa as they intimated that the grass was greener through the open gate. The ewes didn’t question the leaders and led their young into the unknown, never thinking the leaders could be telling lies or just having their own interests at heart. They didn’t seem to have a plan as to what to do once through the gate – I do hope there wasn’t a cunning fox waiting for them all on the other side. I didn’t hang around to see. Now that it seems we officially exist in an intolerant society I feel happier about having a moan about certain dog owners. 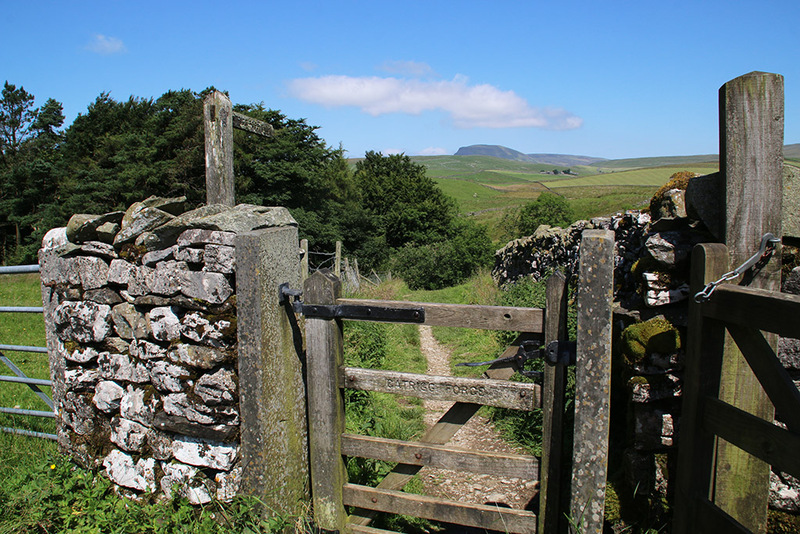 I’m sick of finding these bags of dog crap all over the Dales, at the sides of paths or jammed into drystone walls. I’m sure I’ve seen a lot more crap about since we voted to come out of Europe (that’s a lie, by the way, but it seems lying is acceptable nowadays, too). 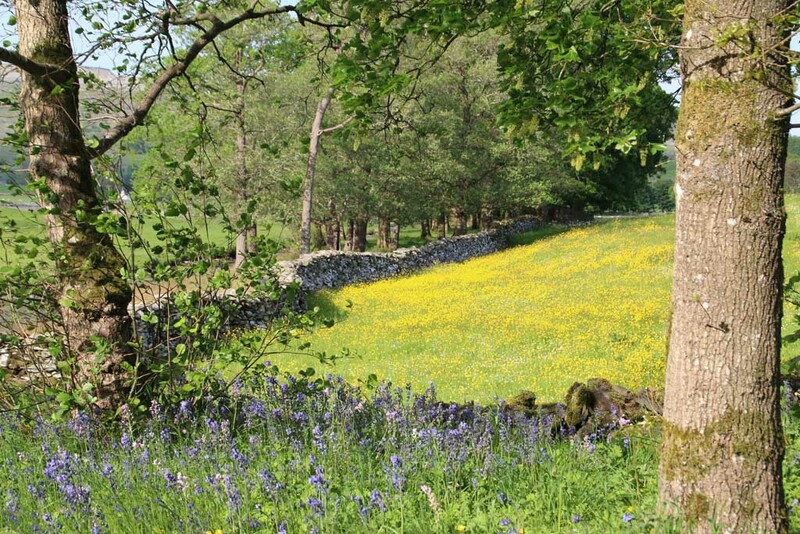 This sign near Penyghent Farm on the wonderful Stainforth to Halton Gill road, says: ‘The Countryside Stewardship Scheme – Part funded by the European Communities’. I wonder if there’ll be a sign here in future saying ‘Left to rot after England turned its back on the European Communities and went bankrupt’? 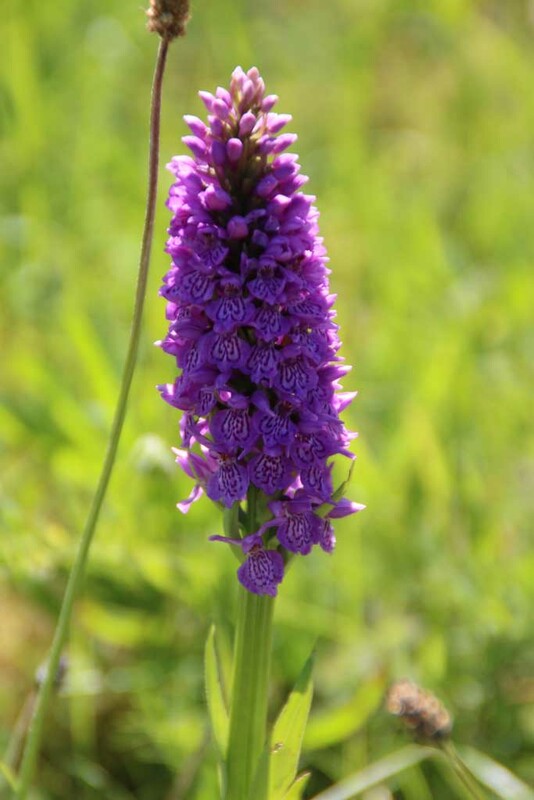 At the moment I, along with many experts (whom I listen to and believe, Mr Gove), don’t feel very optimistic about what will happen to our countryside or local wildlife and heritage projects once the exit from Europe kicks in. During the referendum campaign leave leaders either lied through their back teeth or genuinely just guessed when asked about what would happen to the countryside after leaving. 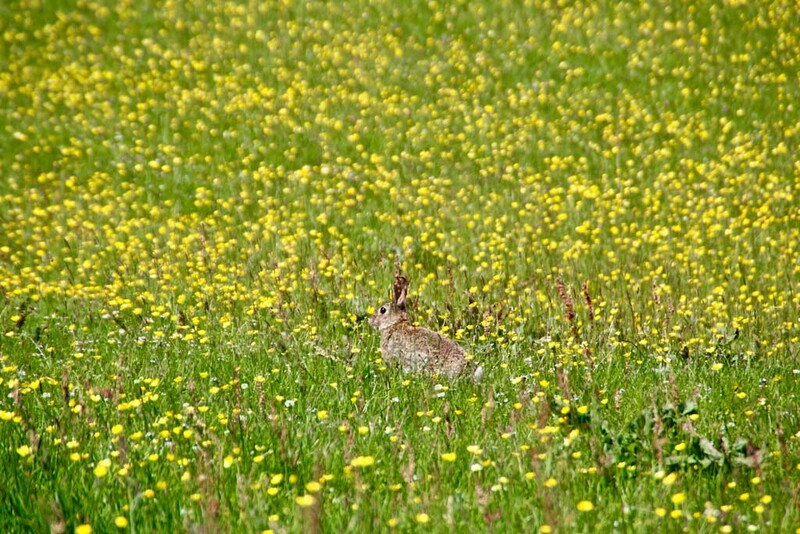 Currently I can’t see where money will come from given the predictions of economic gloom, yet I’ll bet that pet vanity projects like HS2, which revolve around London and which will rip up the countryside for no good reason, will somehow survive. I have a habit of saying stuff that shows my age. This week I said to a youngster (someone under 30), ‘What’s the recipe today, Jim?’ – a phrase which anyone over 60 will probably recognise from radio of the past, but to which the person listening to me responded quizzically by saying that she was not called Jim. 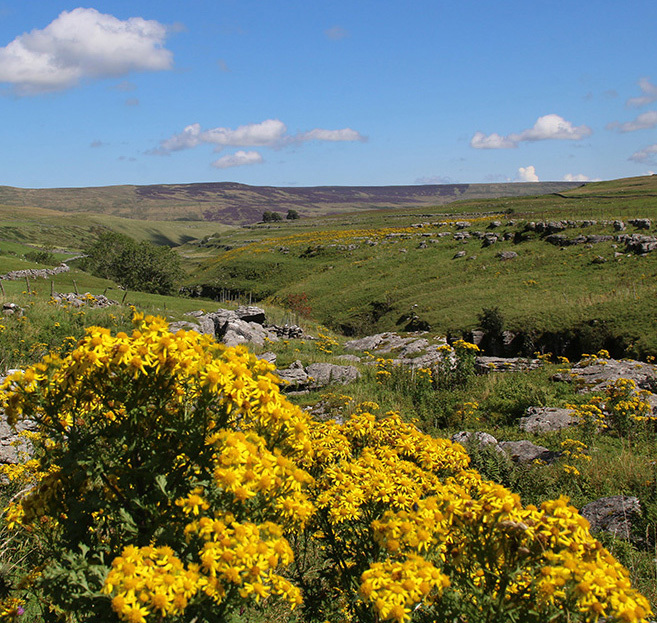 I was very pleased to see the initial plans for The Folly in Settle on Monday. 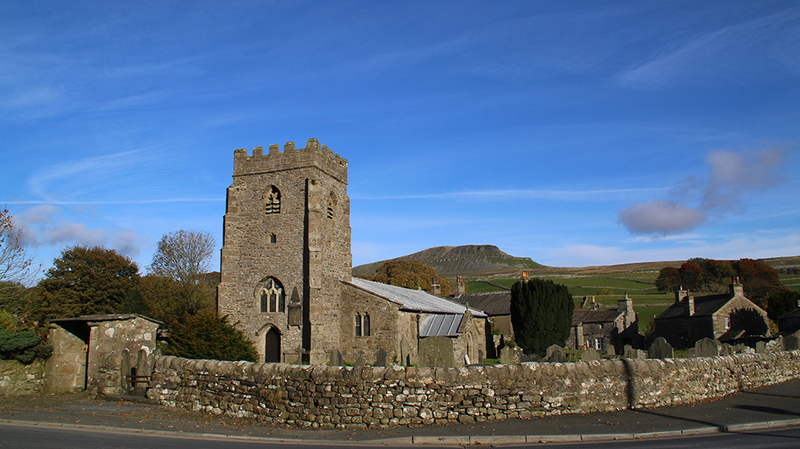 It’s vital that this unique building is kept in good order, is utilised by the community and helps attracts visitors to the Dales town. The Folly’s development will help boost the local economy and provide another welcome focal point. All they’ll need to make the plans come true is some funding … oh, wait a minute though. 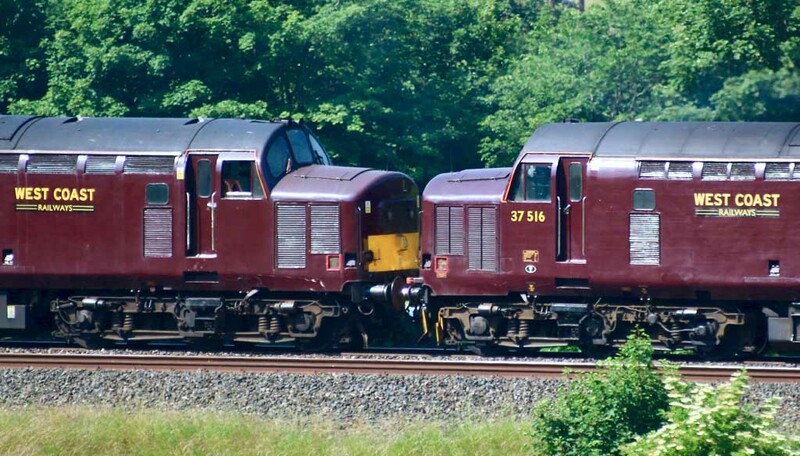 I’m pleased to see that from tomorrow (27 June) train services on the Settle-Carlisle line are to be extended to run as far north as Armathwaite instead of the current terminus of Appleby. 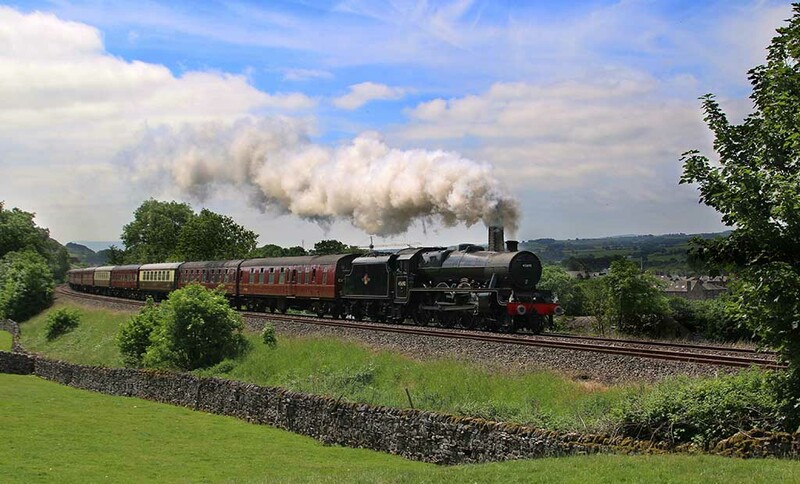 The existing train times between Leeds and Appleby will continue with revised timings for journeys between Appleby and Armathwaite. There will be a number of changes to the bus connections so passengers should check the updated timetable before travel. www.settle–carlisle.co.uk/ Remember, the original purpose of building the line was to access Scotland – this could be handy in the future if there’s an exodus from England to Scotland – let’s hope that repair work on the track north of Armathwaite is completed before the Scots shut the border. I trudged up Buckhaw Brow to watch the cyclists flash by. 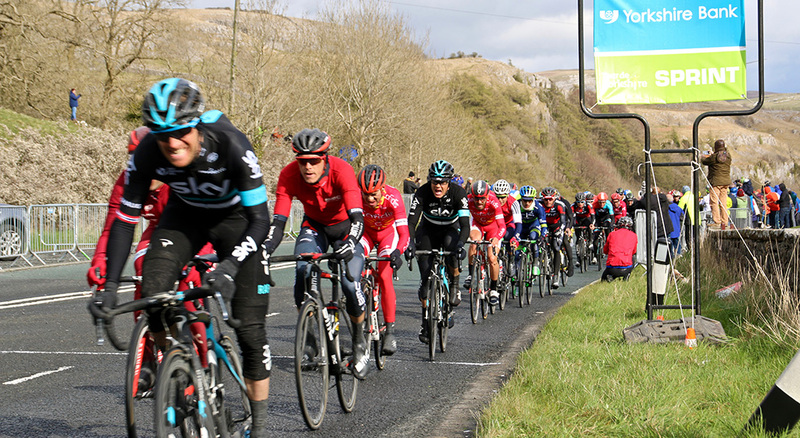 I initially thought it was cruel to start the sprint at the top of a 12 per cent climb, but hey, these guys are masochists anyway so they probably got some kind of perverted pleasure from the pain. 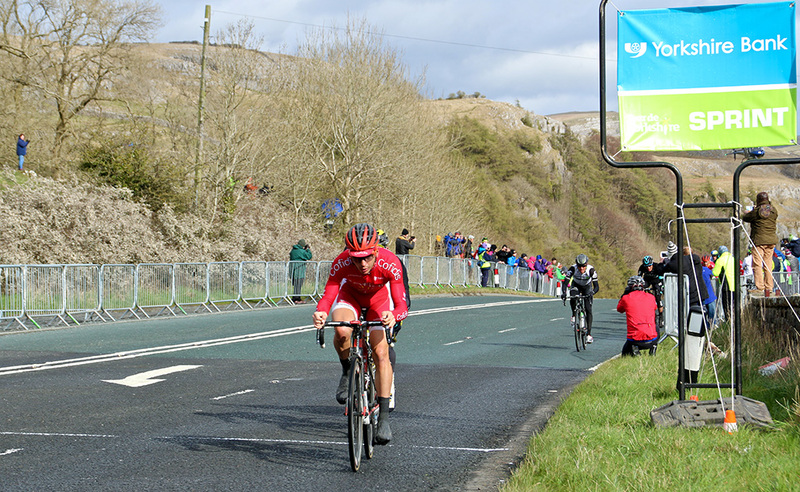 Frenchman Anthony Turgis (Cofidis) – pictured – was first to the sprint start near the top of Buckhaw Brow but he ended the race in Settle in 29th position – serves him right for showing off up t’ hill. Of all the colourful action and crowd photos I managed to capture, my favourite photo of the day was this shot of former Tour de France stage winner Brian Robinson. 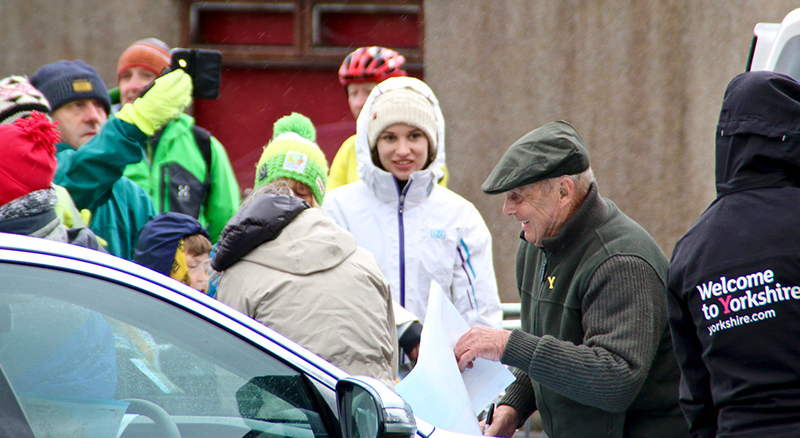 The 84-year-old from Mirfield stopped (in a car entourage, not on a bike) at the start of the sprint to sign autographs and say hello to the hardy souls enduring the cold at this exposed spot. His delight and that of an admiring young fan is clear to see. 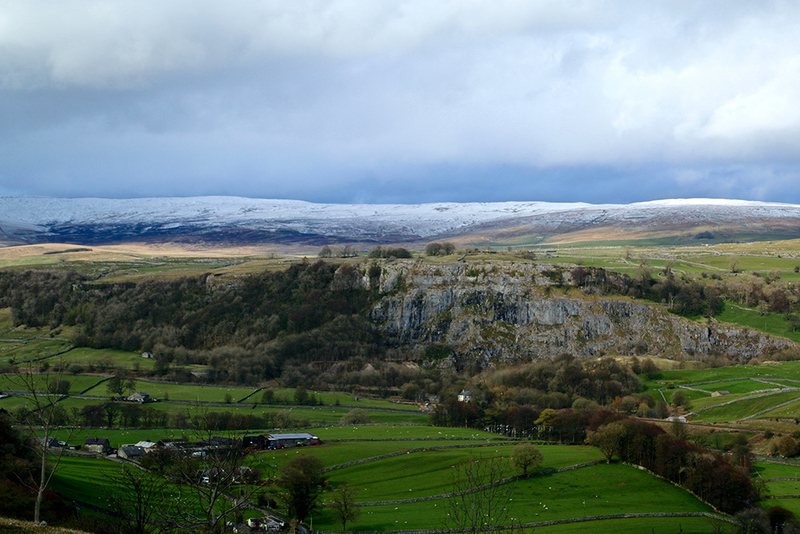 Walking back to Langcliffe from Buckhaw Brow via Giggleswick Scar I could see clearly how much snow remained on the high hills and I wondered how that would affect those taking part in the annual Three Peaks race the following day (yeah, really sleepy this area intit?). As it happened, around 700 athletes completed the course with Marc Lauenstein finishing at Horton in Ribblesdale in 2hr 48min 58sec – just three minutes outside the course record despite the freezing conditions. Mad as a box of frogs, the lot of them. Weatherwise we’ve had all four seasons during the week in the Dales – although we could perhaps have done with some thunder and lightning to complete a full set. 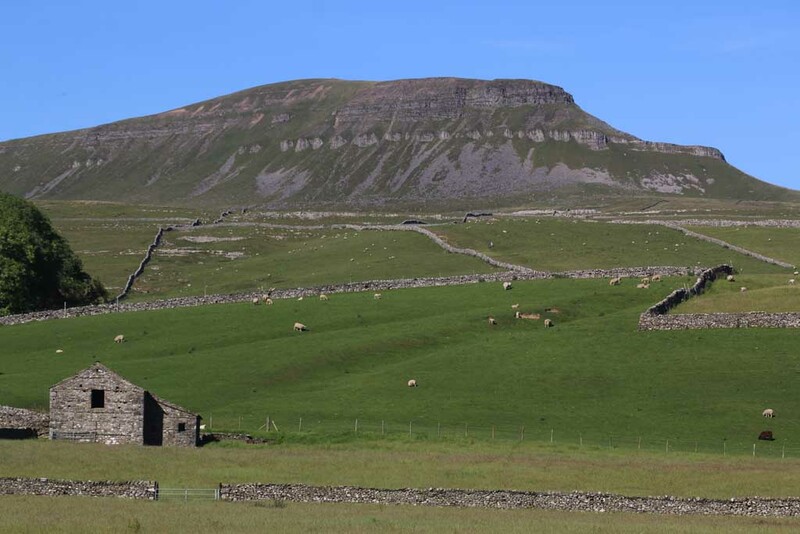 On Tuesday I was driving down Ribblesdale and got a shot of Drybeck Farm and Penyghent (first pic in blog). 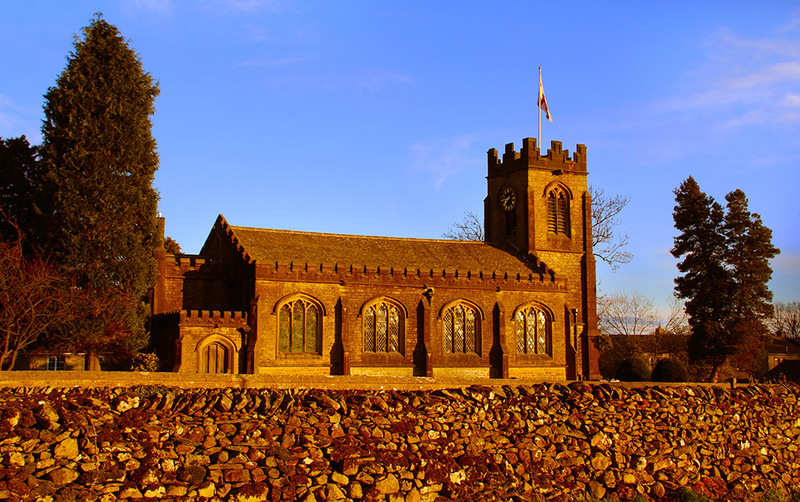 Then around 7.45pm I just had to stop and capture fabulous late sunlight on St Peter’s, Stainforth. This Gothic revival church, consecrated in 1842, might not have the ancient history of neighbouring churches but certainly has a presence. The snowfall got me looking back through my photo archive to see what was happening around this time in previous years. 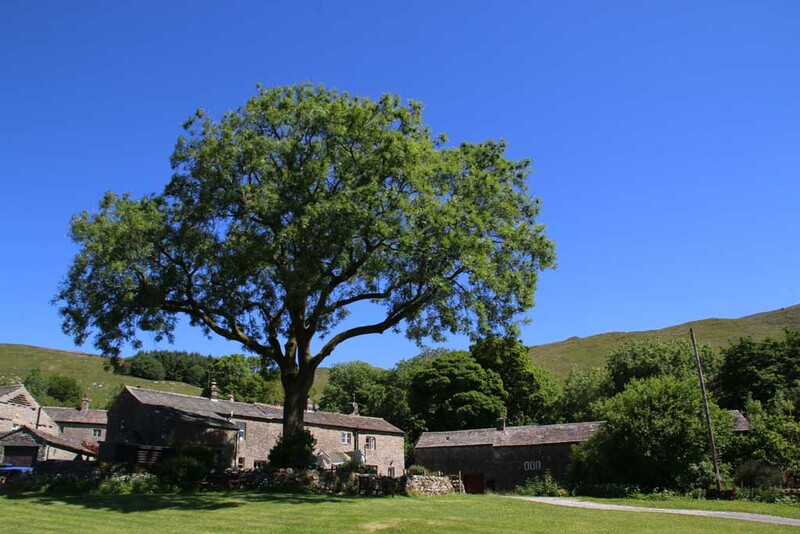 Last year I was enjoying the sun in Littondale where trees were budding well. In 2014, April 29, notice the blossom and greenery at Dent. 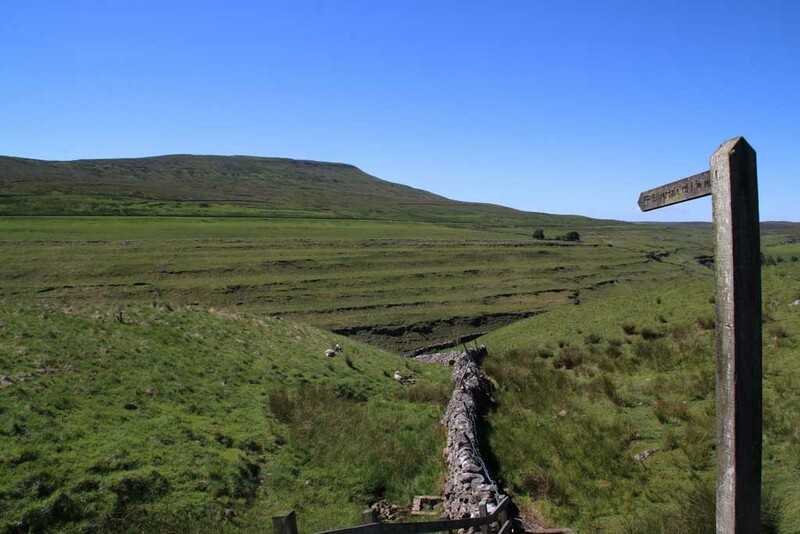 The previous year I walked in T-shirt and shorts beside the Ribble from Helwith Bridge to Horton. 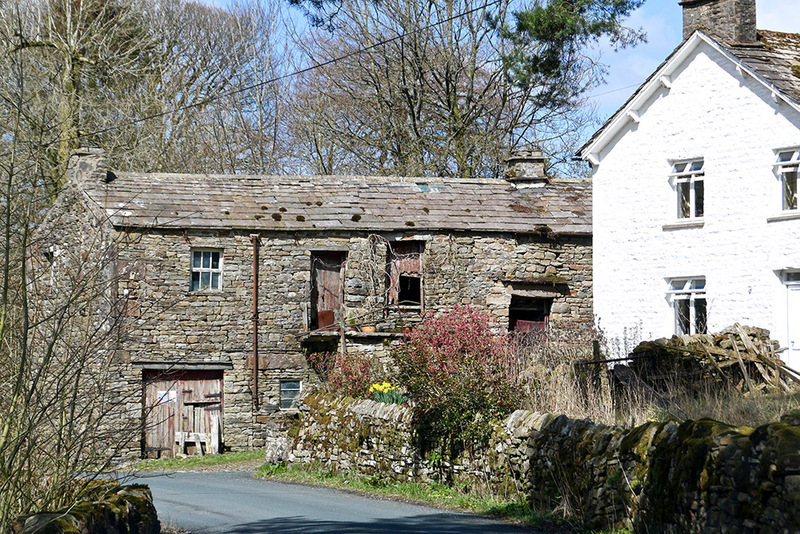 Ripe for conversion in Dentdale?